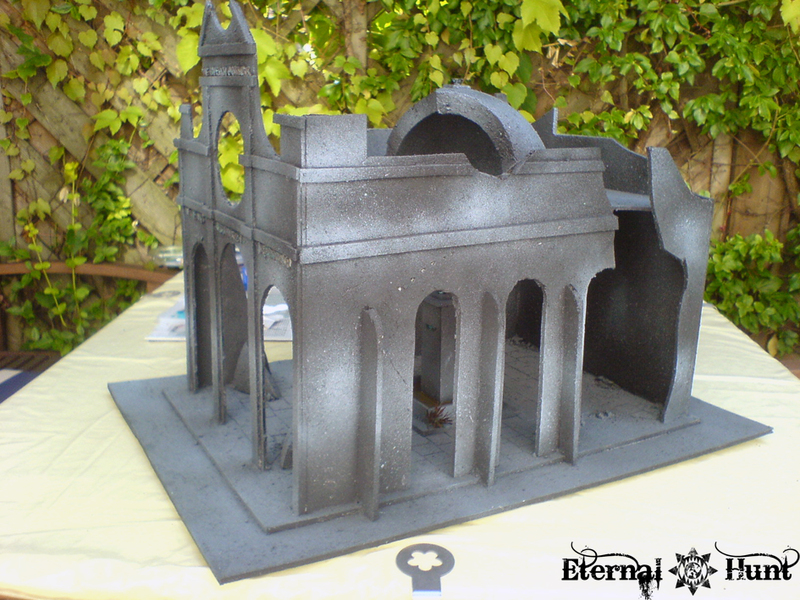 So what about that monument temple made from foamcore I talked about last week? Let’s find out! As you can see, it consists of a column that sits in a small basin (later to be filled with water). 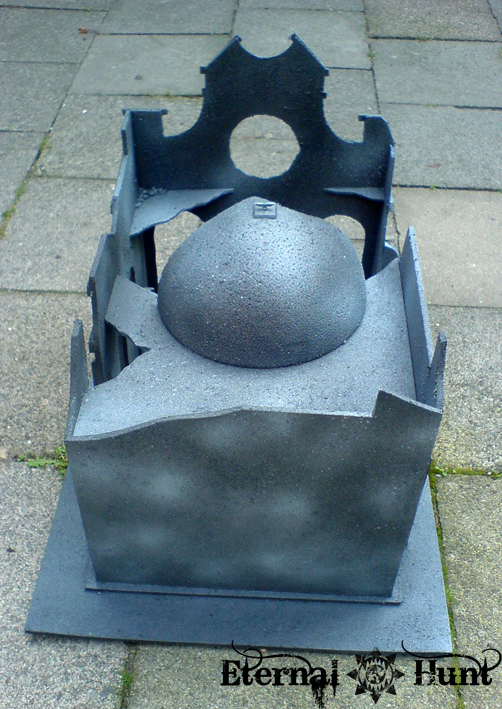 The basic construction was, once again, done using foamcore. A cardboard loo roll would have worked as well to make up a column, but I wanted a different look this time, so I went for a rectangular faomcore construction instead. 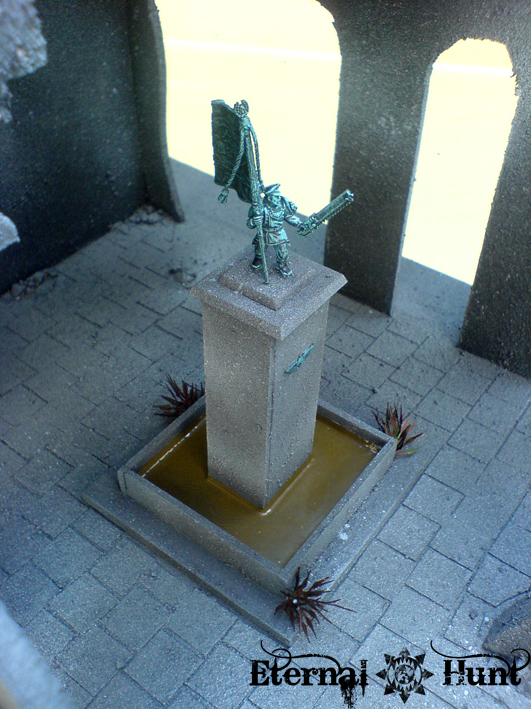 Two square WFB base was used for the abacus atop the column. That way, I could be sure it would be easy enough to attach the actual statue to the column later. 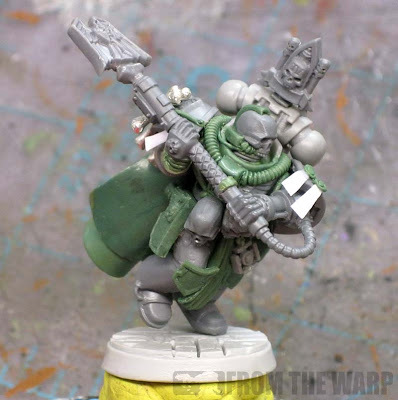 The statue itself consists of bitz from the Cadian Command Squad. 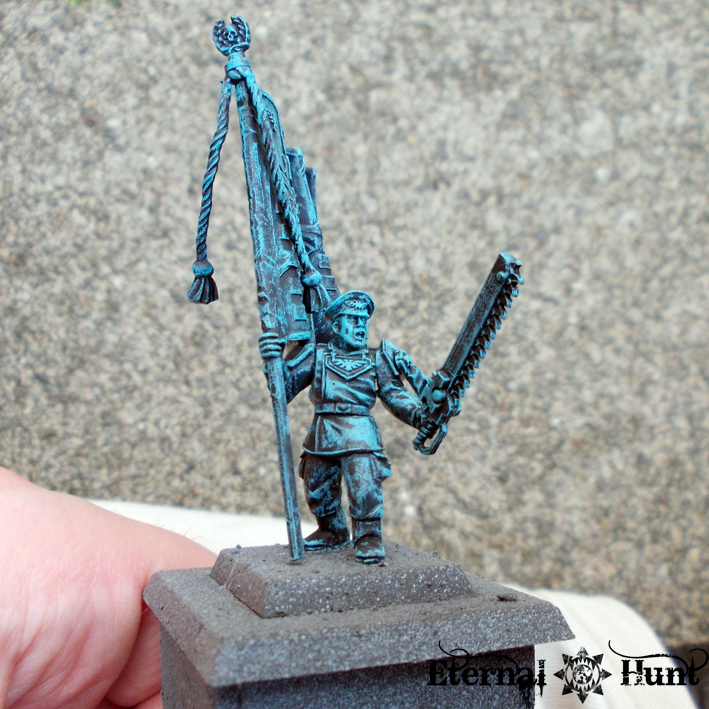 I decided that I wanted the monument to have been erected in honour of the brave Imperial Guard, so I built a guard standard bearer in parade uniform for the monument — a very straigthforward affair. 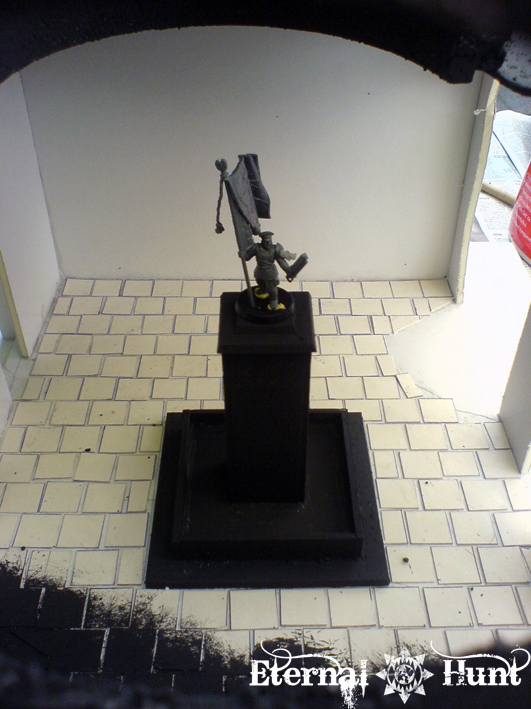 The model was kept separate from the rest of the monument for now. 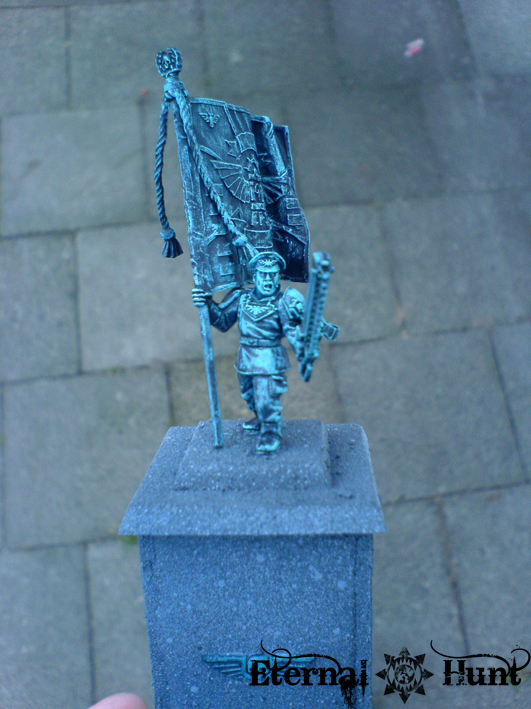 I then used cheap grey spraypaint (picked up at the DIY superstore) to make the monument look like it was actually made of stone. Take care not to apply too much colour during this step, because some of the darker undercoat showing through in places will actually make the piece look more believable. 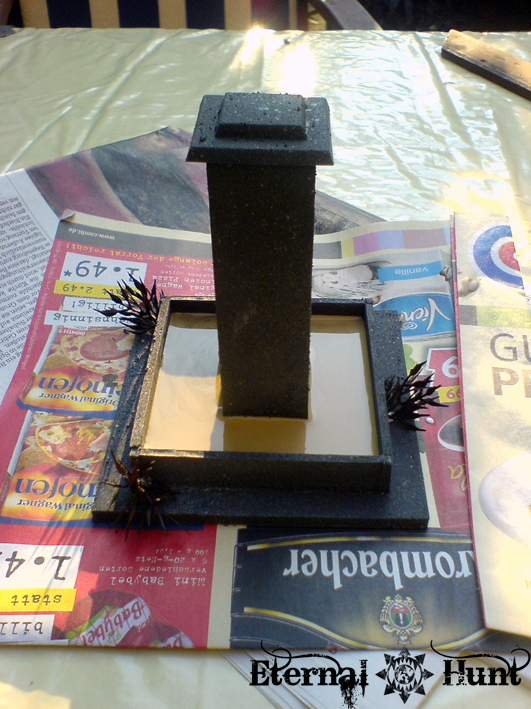 Then I thought about how to best represent muddy water in the shallow basin at the bottom of the column. Since this was only a one-off project, I didn’t want to spend money on a huge bottle of water effect, so I had to develop a plan B. In the end, feeling slightly adventurous, I mixed PVA glue with a bit of water that I had in turn couloured using a mix of brown and green hues (mainly GW Gretchin Green, GW Scorched Brown, and some GW Rakarth Flesh). The resulting mix was then poured into the basin — if you’re trying something similar, make sure the basin’s actually waterproof and the stuff doesn’t come out at the seams! The mix also has to be thick enough, so use quite a lot of glue! The water’s mainly there to add the colour and to make everything slightly more fluid. Here’s the monument after that step: As you can see, the water ended up suitably brackish and dirty — just as planned. 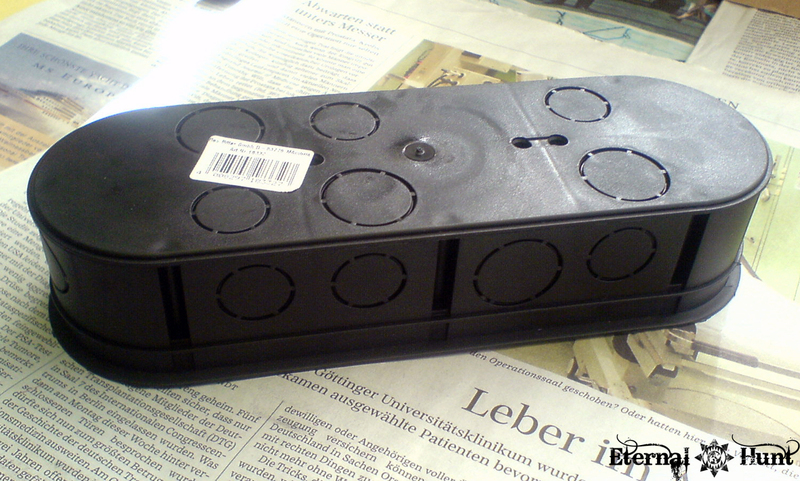 I also added some plastic plants that I spraypainted brown to make them look dried and withered. The monument was then set aside to allow for the “water” to dry. This took about 24 hours for this relatively shallow basin, so resist poking it to see whether is has managed to set yet! I actually couldn’t wait and made a (very small) indetation into the surface that way. Trust me: You need to be patient for this! In the end, the “water” ended up looking nicely brackish and with a glossy surface, making it look reasonably realistic. I would have loved the mix to retain some of the glue’s usual transparence, but alas, it was not to be. Still, definitely better than getting some expensive water effect for a simple one shot! 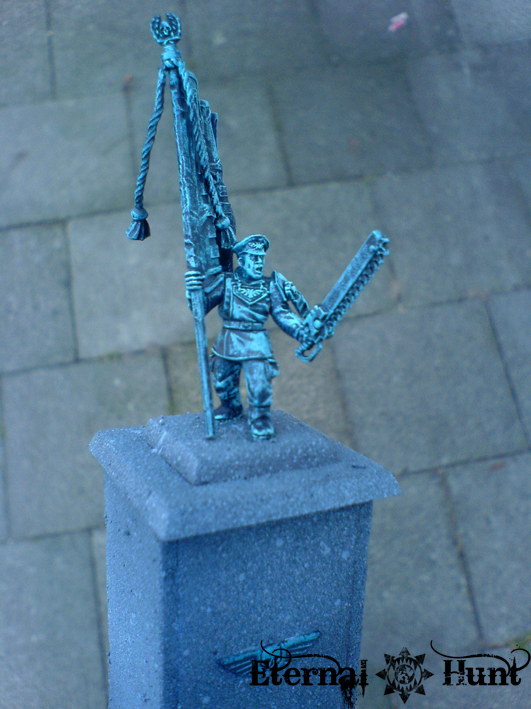 I then painted the actual statue, which was really very easy: The model was undercoated with GW Chaos Black spray, then basecoated with a 60/40 mix of GW Chaos Black and Vallejo Halcon Turquoise. 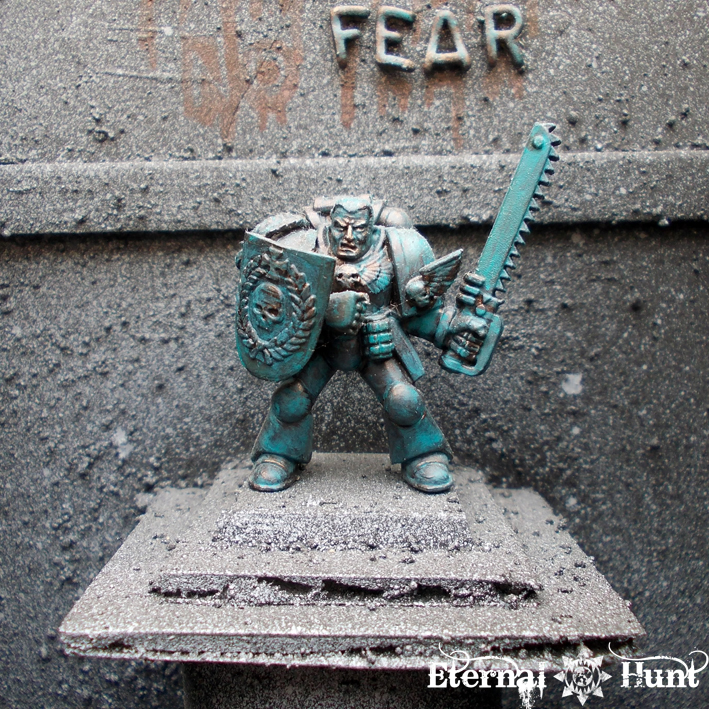 Then I drybrushed the model with a 50/50 mix of GW Skull White and Halcon Turquoise. The raised detail on the regimental flag lent itself especially well to this technique. 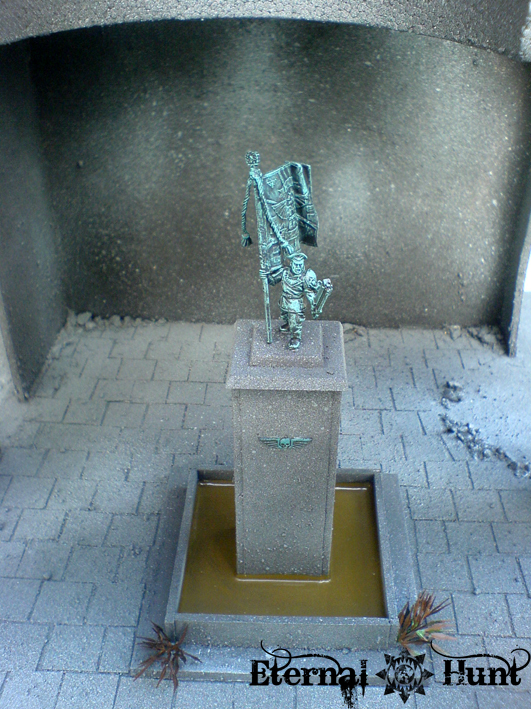 As you can see, the statue’s surface looks like heavily oxidised metal, just like you might see on a real-life statues you might see in your vincinity. All in all, I was very pleased with the effect. The statue was glued to the column using superglue. And with that, the monument was finished. 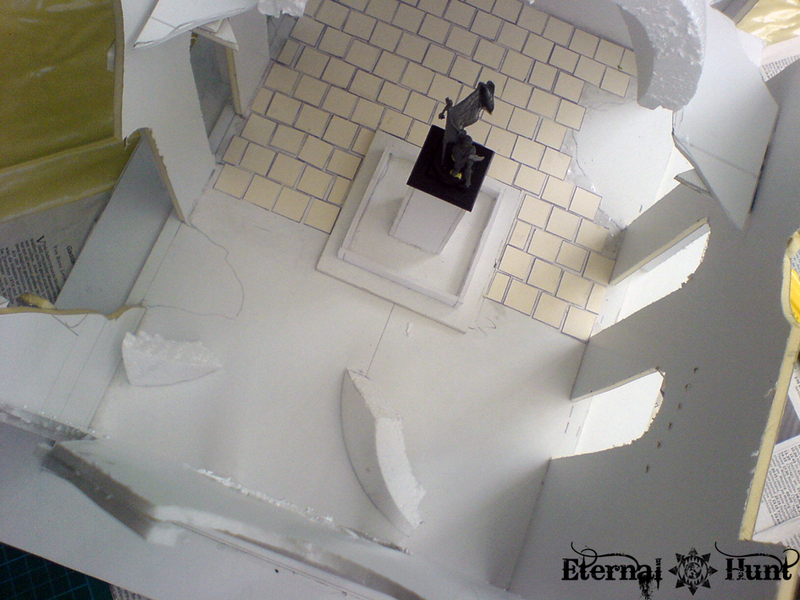 You can really add lots and lots of the stuff for added realism, plus segments of fallen walls and ceilings. Personally, I tend to go for a less realistic result simply because it’s pretty hard to add multiple layers of rubble and make sure they stay in place. 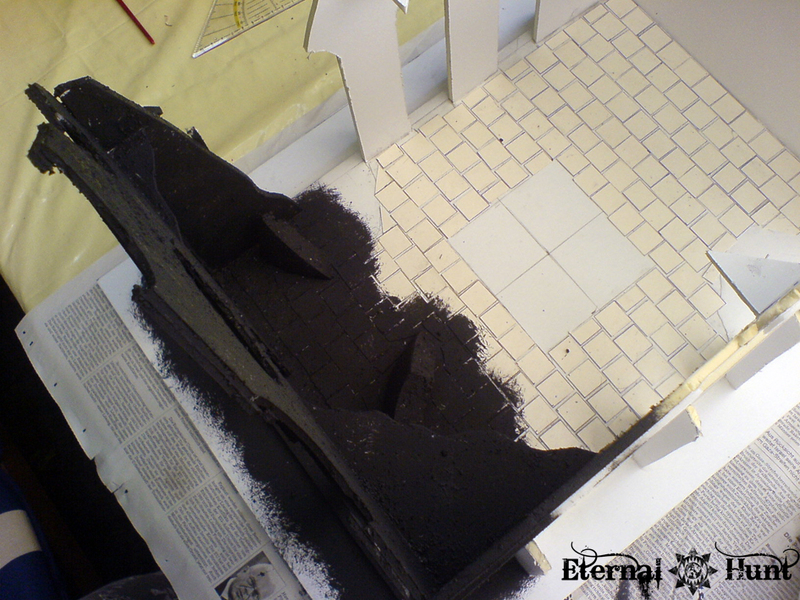 And too much rubble and uneven surface texture can also mean it will be hard to actually place your models in the building during games. Anyway, a second coat of thinned-down glue was added on top to seal the rubble. Then the rubble areas were sprayed once again with black. 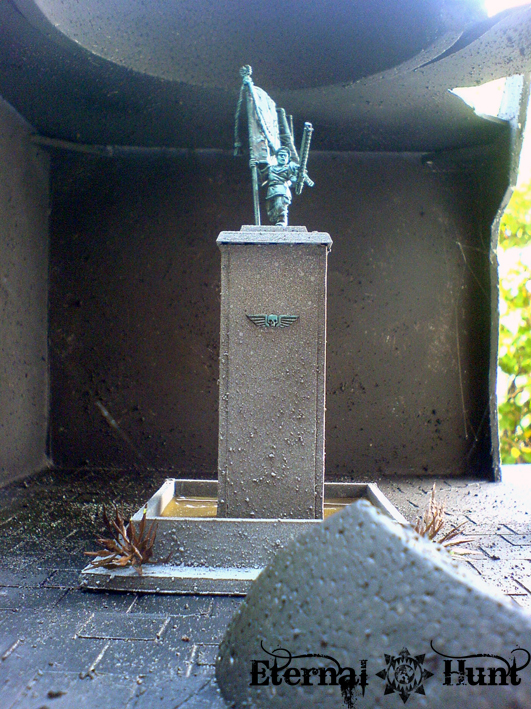 After everything was dry, the building was sprayed with the same grey paint I had used on the monument. Again, go for a slightly uneven approach to create plausible shades and a more realistic looking surface. Looking back now, there’s quite a bit that could still be added: It might look cool to drybrush the tiled floor with white to pick out the contours. Posters and propaganda proclamations could be added to the building, as well as blood splatters, additional damage etc. I am still free to do all of this, however, as the finished build should be easy enough to modify. 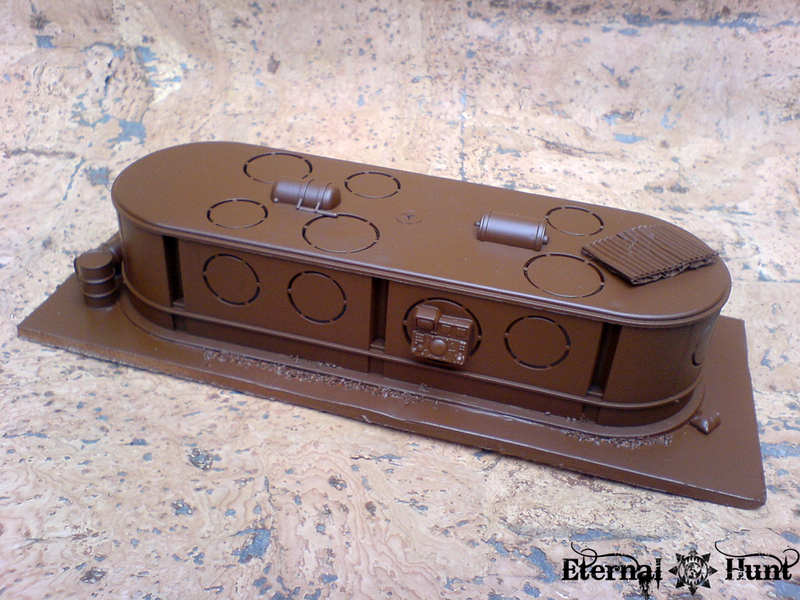 In any case, I hope I was succesful in showing you how easy it can be to come up with a centre piece for your gaming table. All C&C are welcome, of course: Just let me know what you think in the comments section! 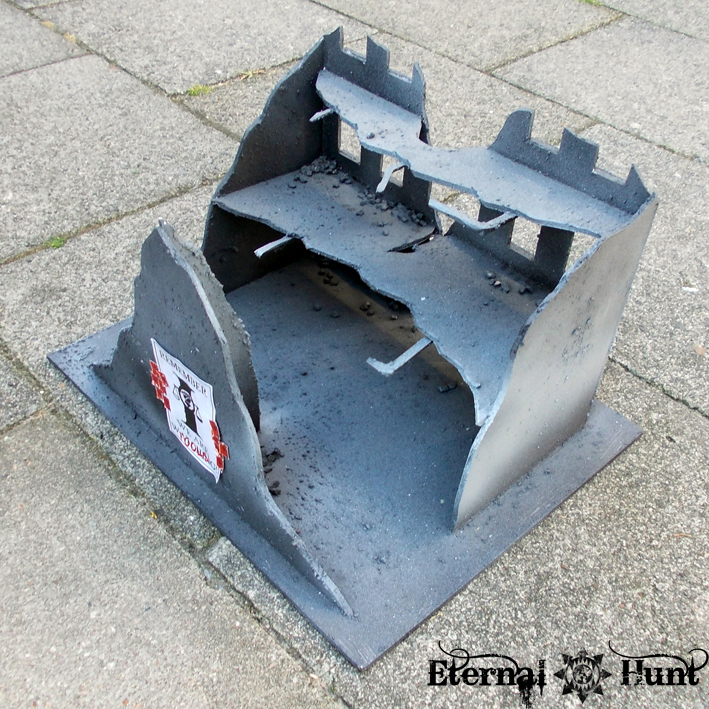 It’s been quite a while since I last posted about building terrain, but since the weather has picked up considerably in the meantime, it is now time once more to go outside, hit the tool shed or garage and build some wargaming terrain! The funny thing is that I am pretty spoiled when it comes to terrain nowadays: There’s some exquisite terrain over at the FLGS, and stuff like Neil101’s stellar Arrke board, most of the stuff used during this years Inqvitational or Chelnov’s unbelievable Sisyphus Complex have taught me that my own meagre efforts at building terrain are already outdated by a pretty huge margin. I am also pretty convinced that I could do better nowadays, but some of my early recipes should still have some merit, especially to those of you who have been putting off building their own terrain for one reason or another. 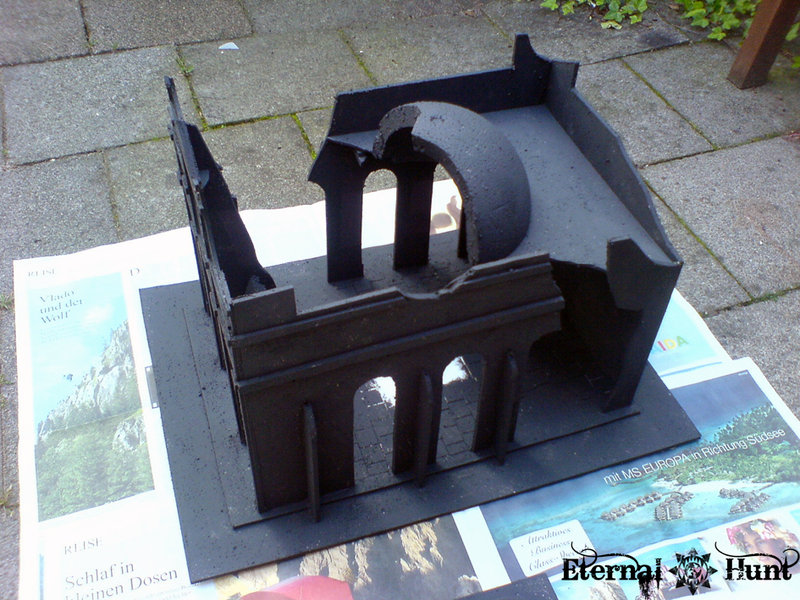 I already discussed quite a while ago how easy it is to make some reasonably convincing ruined buildings out of foamcore. 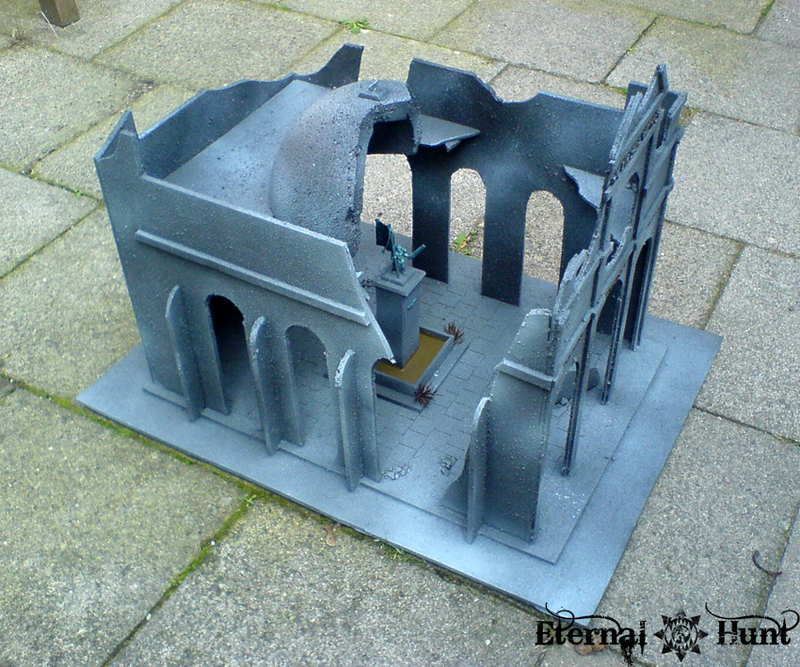 Buildings like those will also allow you to fill up quite a huge gaming table. But you probably don’t want your entire terrain collection to consist of simple, bombed out hab blocks, do you? Well, here’s the good news: Building bigger and more sophisticated structures can be almost as easy. This two-part post will take a closer look at that! 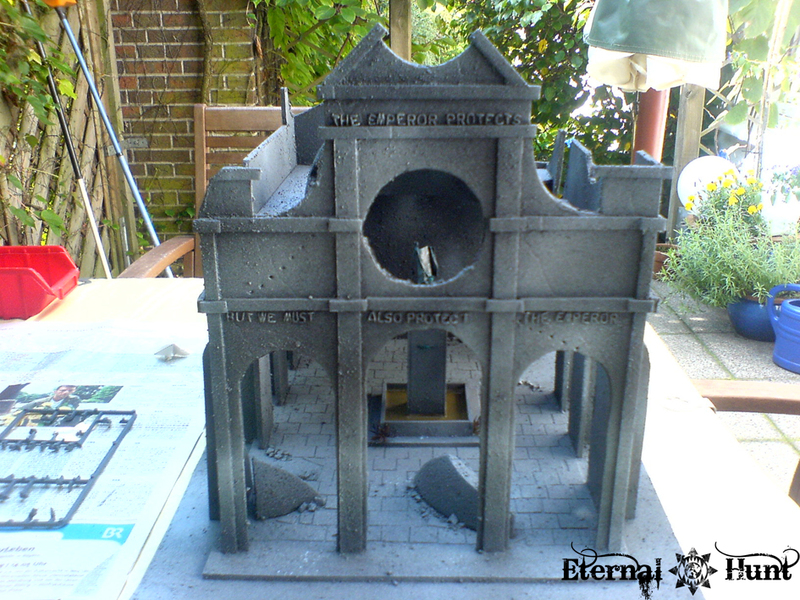 Everything started with my desire to build a larger building that was to serve as some kind of centrepiece on the table: I wanted something decidedly bigger than one of my ruined hab blocks, but maybe not quite as gigantic as a cathedral. 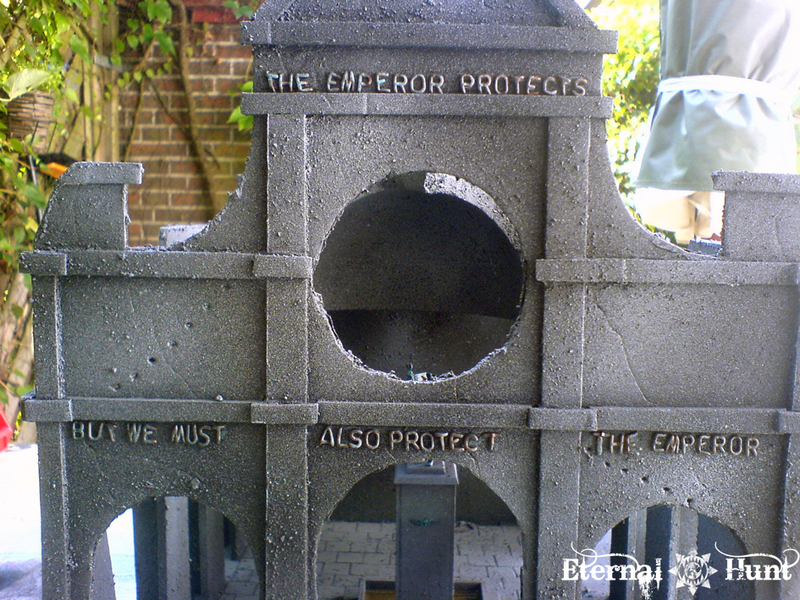 So I decided to try my hand at a temple-like building housing a monument to some glorious achievement or other of the Imperium of Man. The most impressive part of the building is its façade, but this part was actually pretty easy to get right: I just drew a suitably impressive design on a piece of 3mm strong foamcore, then cut out all the arches and recesses with an exacto knife. Pieces of the same thin foamcore were then used to add projections to the wall and give it some depth. And I also added an inscription using alphabet noodles. 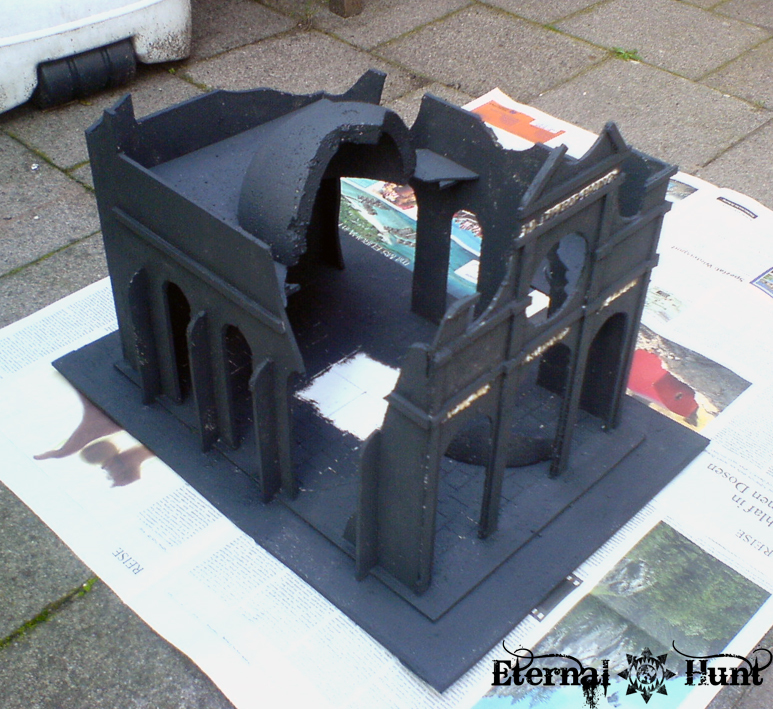 The side walls are a very easy construction, with just a number of archways cut out of the foamcore I used. 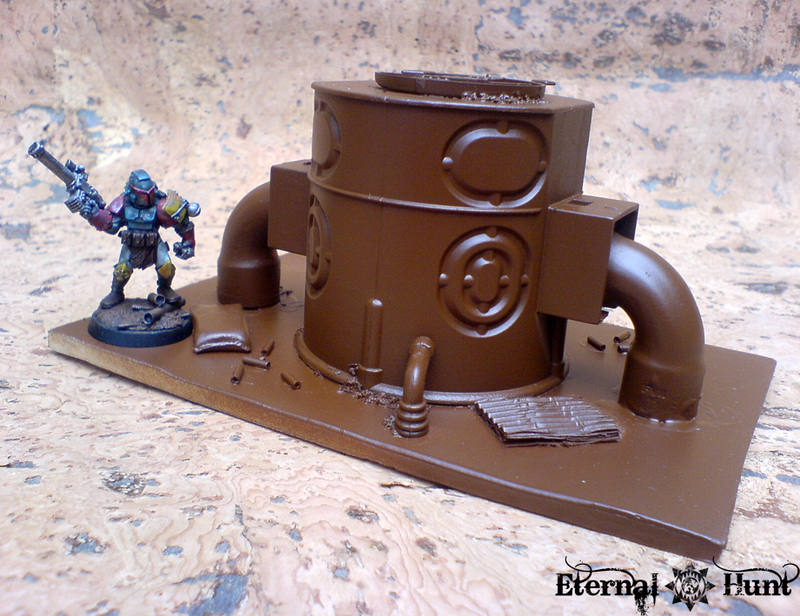 And a thicker kind of foamcore was used as a base for the whole building. 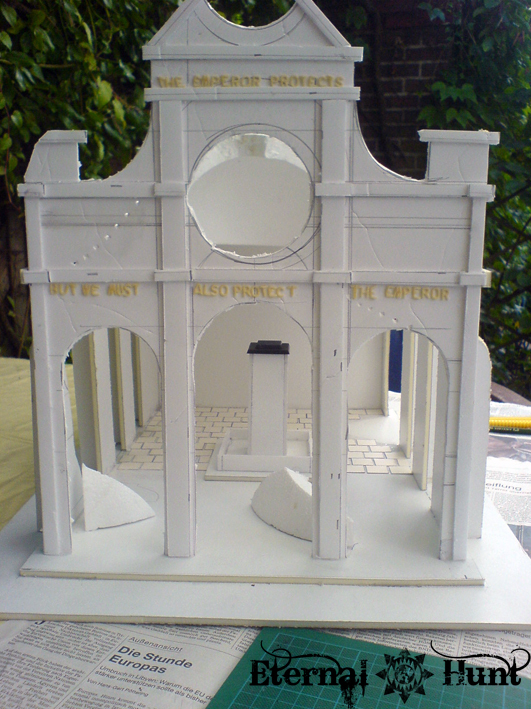 The whole construction was very easy to put together, using PVA glue. In order to make the building look suitably damaged from artillery fire and the ravages of war, I cut sections out of the side walls and dome. Pieces of the dome were then glued onto the floor of the building, to make it look like they had fallen when the dome was partly destroyed. As you can see, I drew some lines around the damaged wall sections to mark the areas where the floor had been damaged as well. On these areas, I didn’t use any of the floor tiles or at least made sure they looked damaged enough. 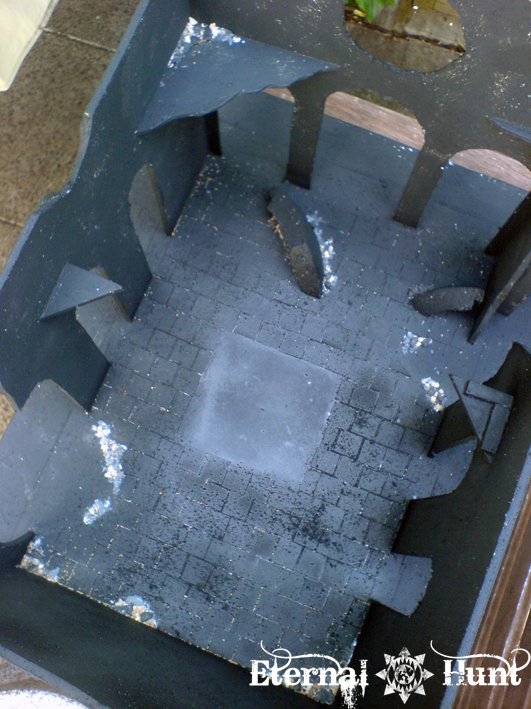 I also made sure the roof would be removable, in order to facilitate access to the building’s interior. 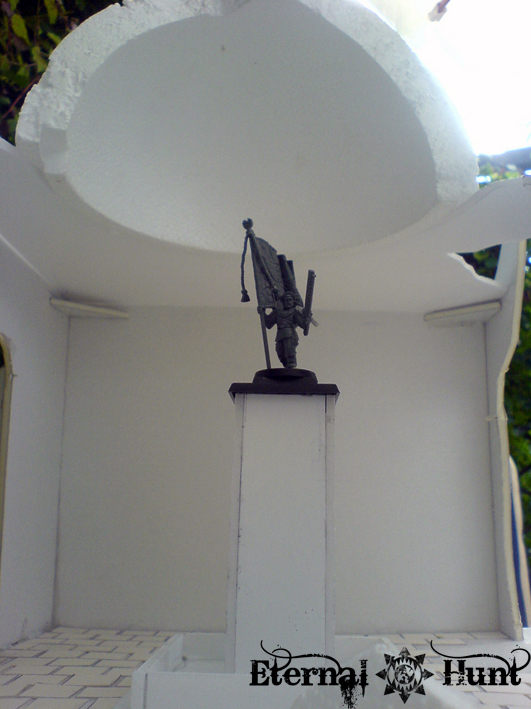 This was achieved by adding a very simple foamcore construction underneath the roof that was stable enough to carry the roof when it was placed on top. You can also see a part of the construction holding the roof in place at the bottom of the picture. So the next step was to get the whole building undercoated — definitely the hardest part of the whole exercise! 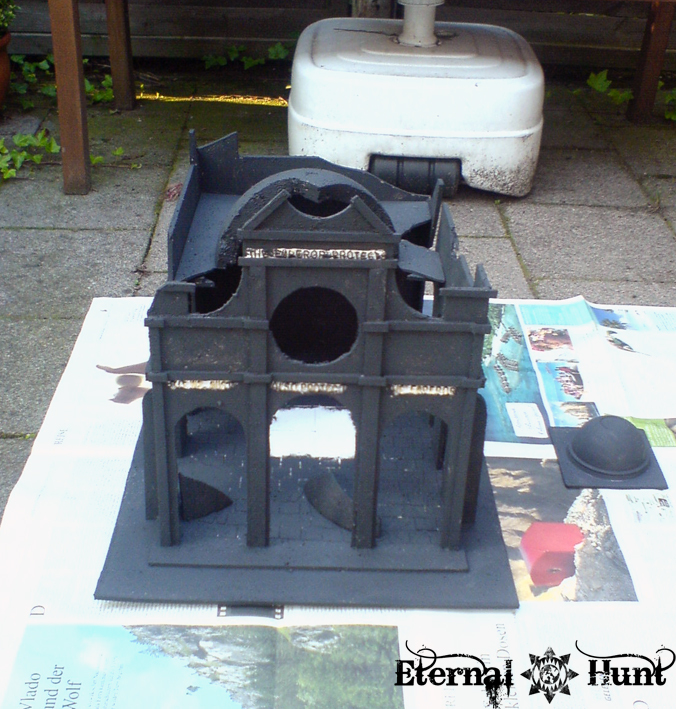 I prepared a suitable undercoat by mixing black and white acrylic paint, some PVA glue and some fine bird sand (to add some texture to the paint and make the building look less like it’s made of foamcore). This kind of paint is really easy to mix and very cheap too. It also works as a sealant, making sure the foamcore’s foam interior doesn’t melt away, once you start using spray paint at a later point. I won’t lie to you: Getting a building this size undercoated takes some doing (and a pretty large brush). And, please, don’t go using your expensive Citadel brushes for this, you hear! 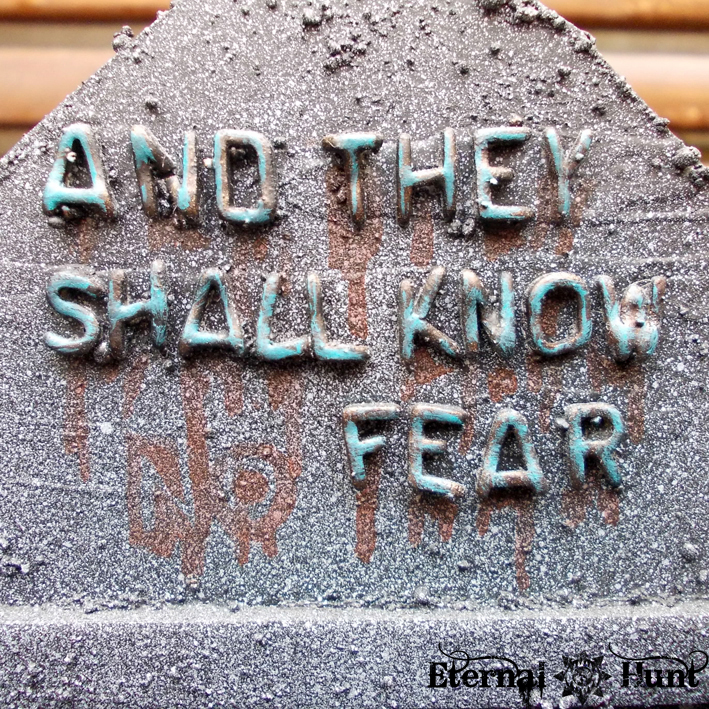 I was afraid to damage the inscription with the brush, for one, plus you don’t want any grains of bird sand on those letters: They will have to look like metal later on, so any residue from the texture paint would destroy the illusion. 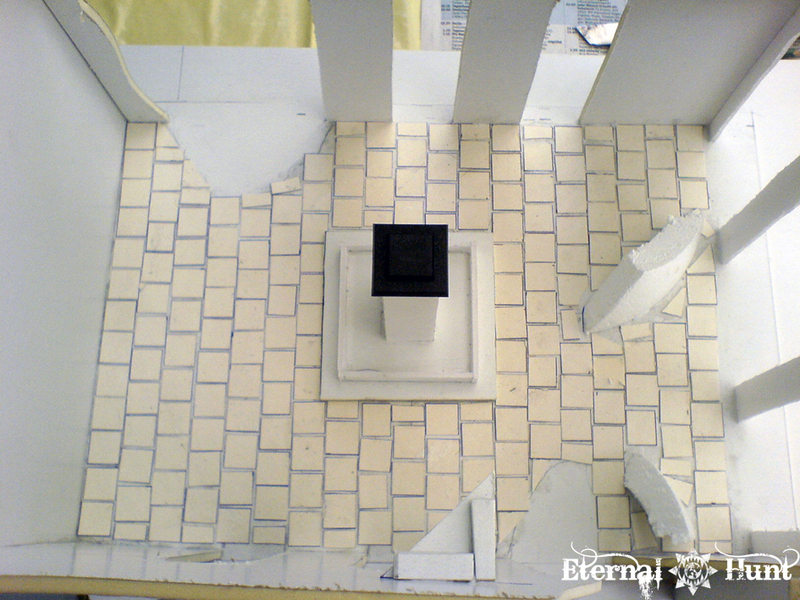 The empty space was left unpainted because the monument should be easy to place, and that wouldn’t work with the floor all roughened up and uneven from the texture paint. And with that, the basic construction was completed. 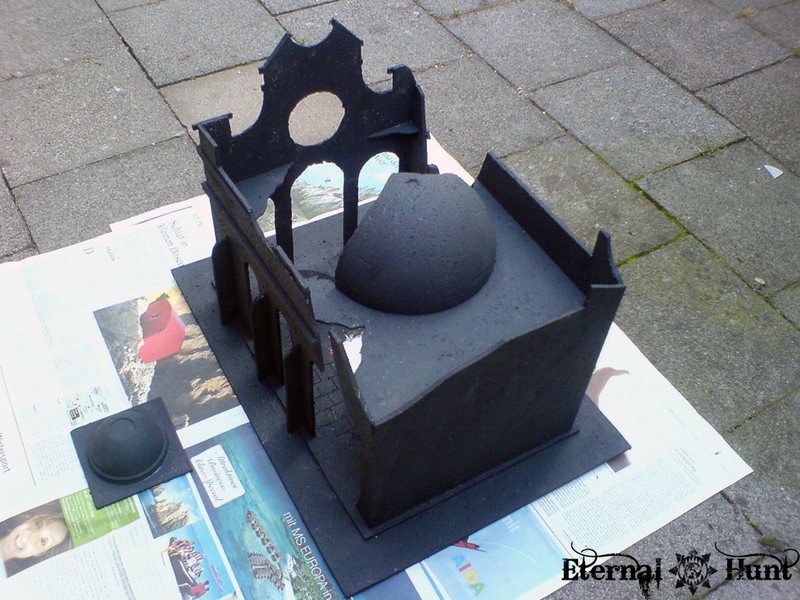 In the next installment, we’ll look at the additional details, the construction of the monument itself and the rest of the paintjob. Another quick and easy tutorial of sorts: This time we’ll deal with how to easily build a couple of ruined buildings in very short time. 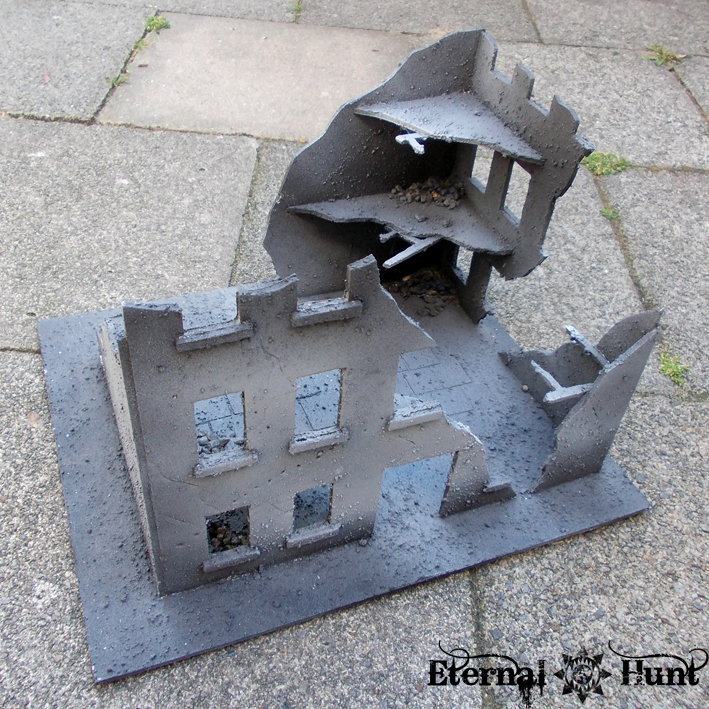 Ruined buildings and crumbling hab-blocks are a staple of cityfight tables in particular and 40k terrain in general. 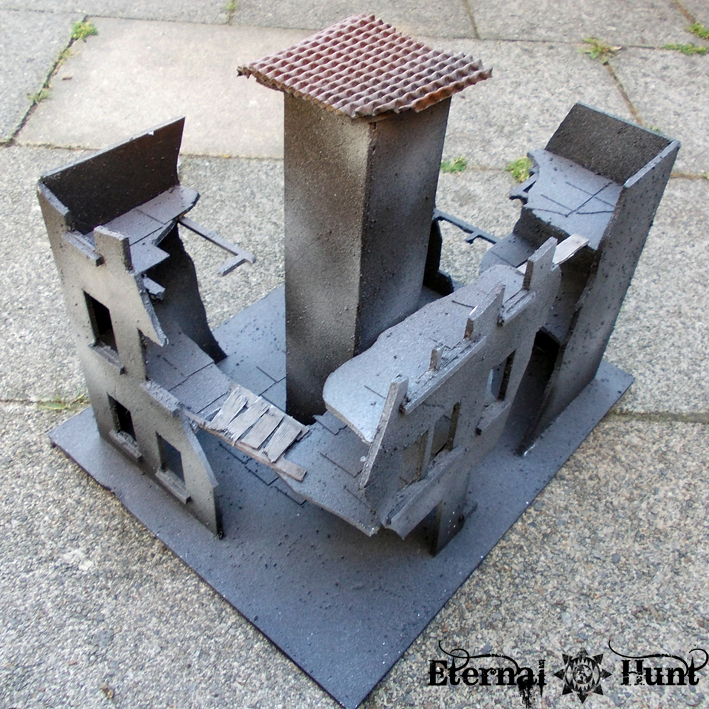 It’s no surprise that GW has released lots and lots of easily assembled and nicely detailed cityfight ruins, and those kits are great! But sometimes you’ll want to fill up a lot of table space in a short amount of time, and maybe you also don’t want to spend a lot of money. And then, maybe you’re a bit like me and get a kick out of building terrain with readily and cheaply available materials? If you can subscribe to any (or all) of the conditions listed above, this post is definitely for you! 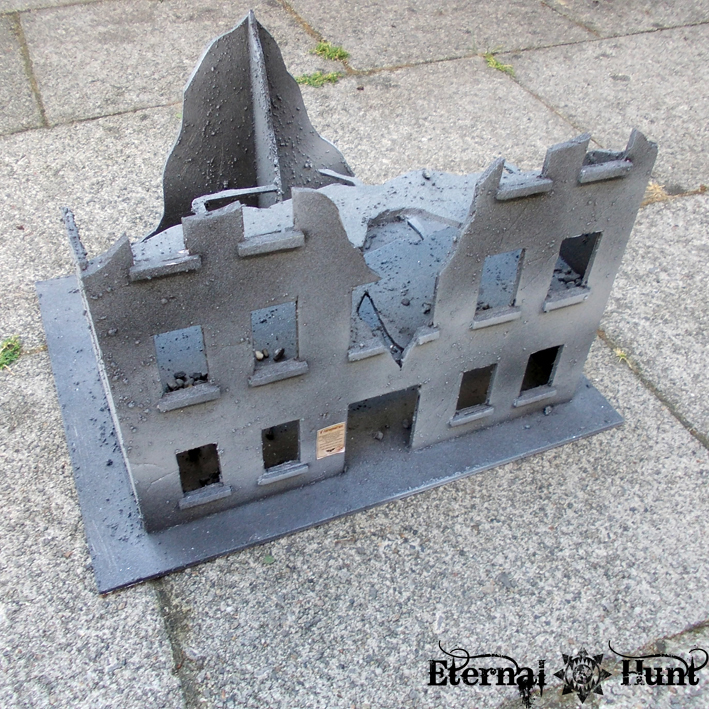 There are lots of useful materials when building your own ruined buildings: Cardboard, plywood, styrofoam and many others. Personally, I tend to go for foamcore, though, since it’s usually readily available and easy enough to handle. 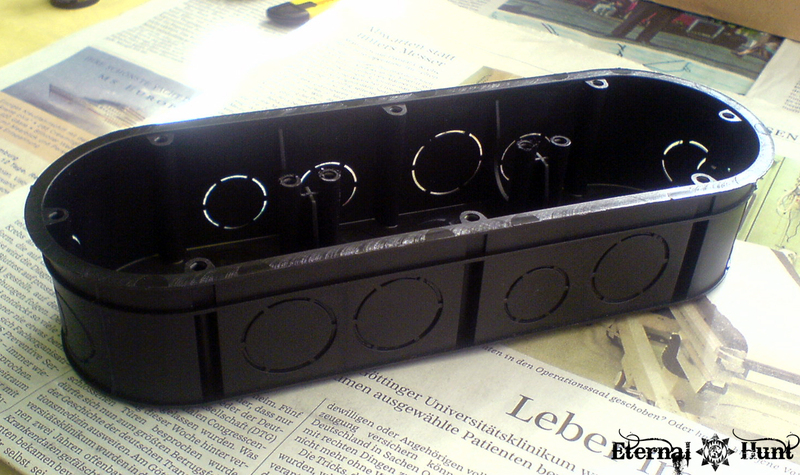 I usually work with foamcore of two different thicknesses: 2.5 mm and 4 mm. While the former is easier to cut, the latter is great for jobs that require more stability (outer walls, bases). 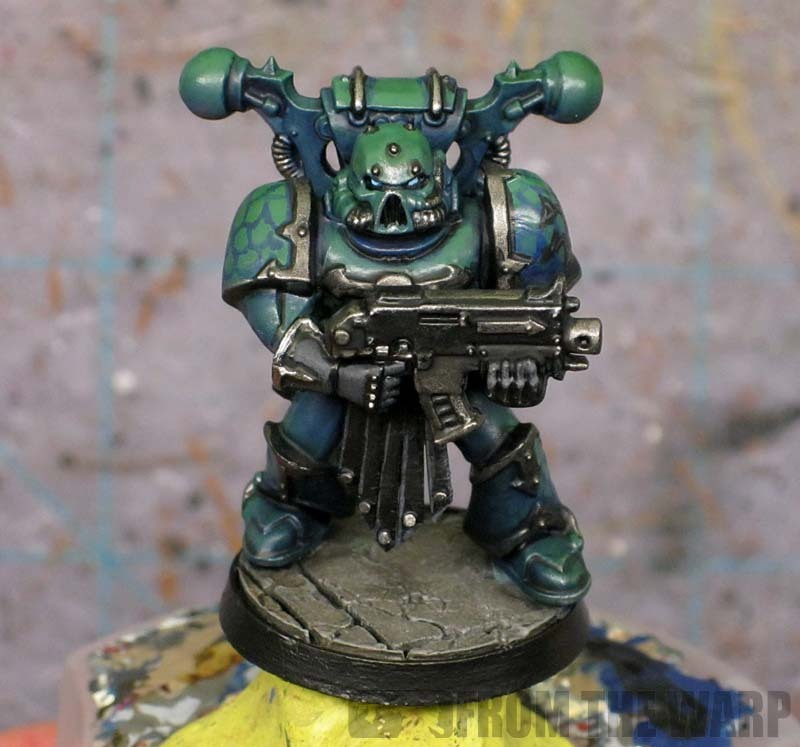 I used a 40k model for reference to get the proportions right. Since I needed some space to attach the template to the foamcore (using paperclips), the actual template is slightly smaller in size than A4. There also wasn’t enough space to add a full story at the top, as you can see. I found an easy way around that, though: Just cutting off half of the uppermost story, making it look like it had been partly destroyed. In addition to my rather crude sketch, there are also all kinds of great templates floating around the net, by the way. 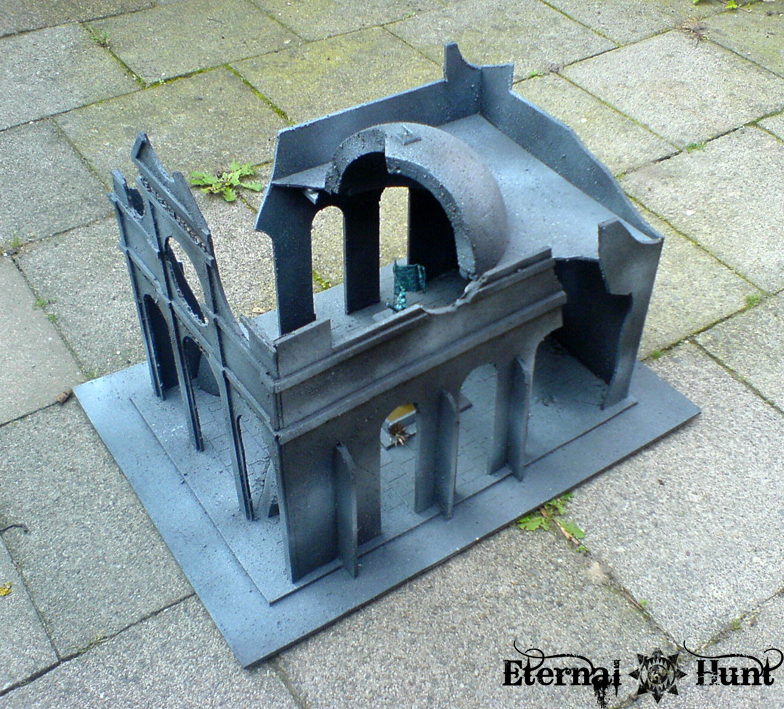 For a while, even GW offered a set of templates for hab-blocks, although I always found these a little off in scale. Anyway, it’s very easy to come up with a fitting template yourself or find one online. 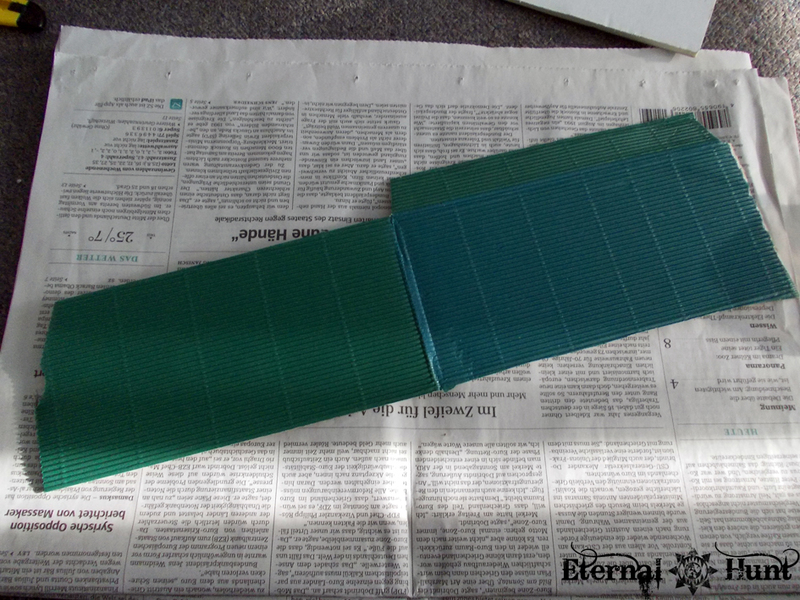 After that, it’s really as easy as just cutting the foamcore to resemble the template. Be sure to use a very sharp exacto-knife for this, though, to make sure you get smooth edges when cutting: Foamcore tends to wear out blades pretty fast, so take care! 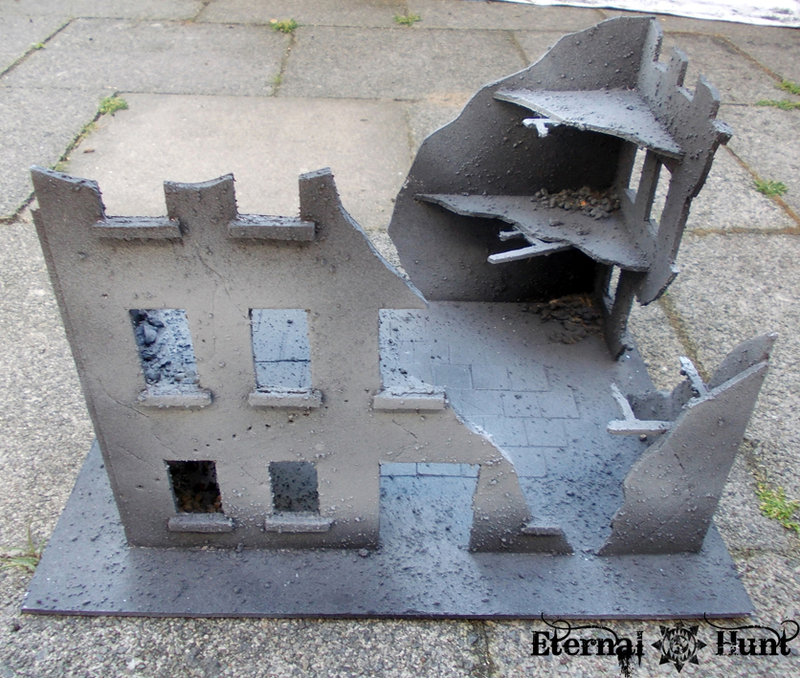 Once you have a finished wall, you can either just glue it together with other pieces of foamcore to make a building, or you can add some damage. If you cut the wall roughly in half, both halves can then be used to form different walls of the building, leading to a bombed-out look. Actually constructing buildings is really easy: Just glue your wall to a base (made of plywood or thicker foamcore), attach other pieces of foamcore at a 90 degrees angle, and you’re good! 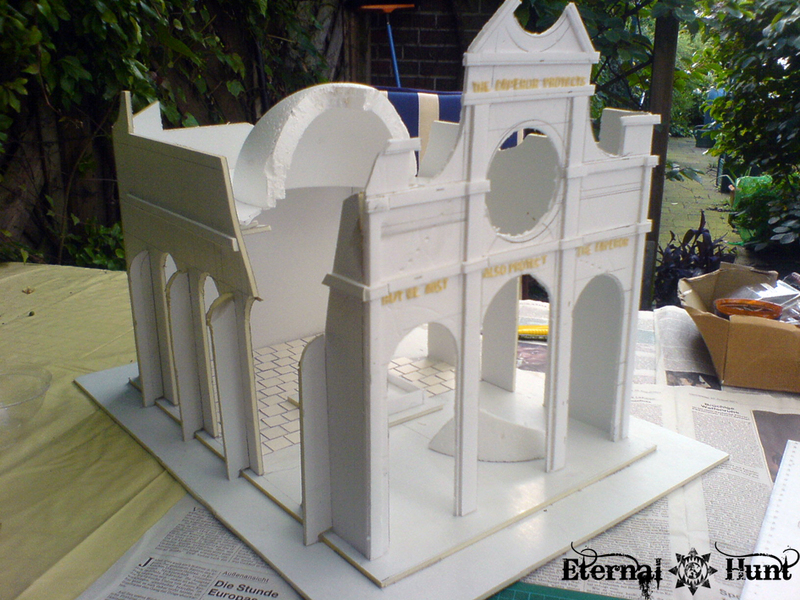 Foamcore is easy to glue together using wood- or PVA glue. As you can see, you can achieve a very different look by just changing around the configuration of the walls. 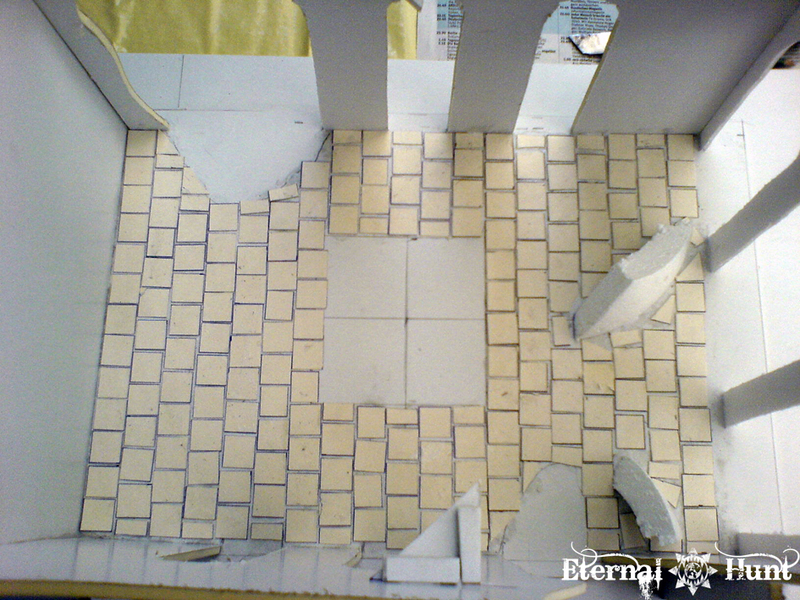 I also added in the remains of the buildings’ different floors, using leftover pieces of foamcore. 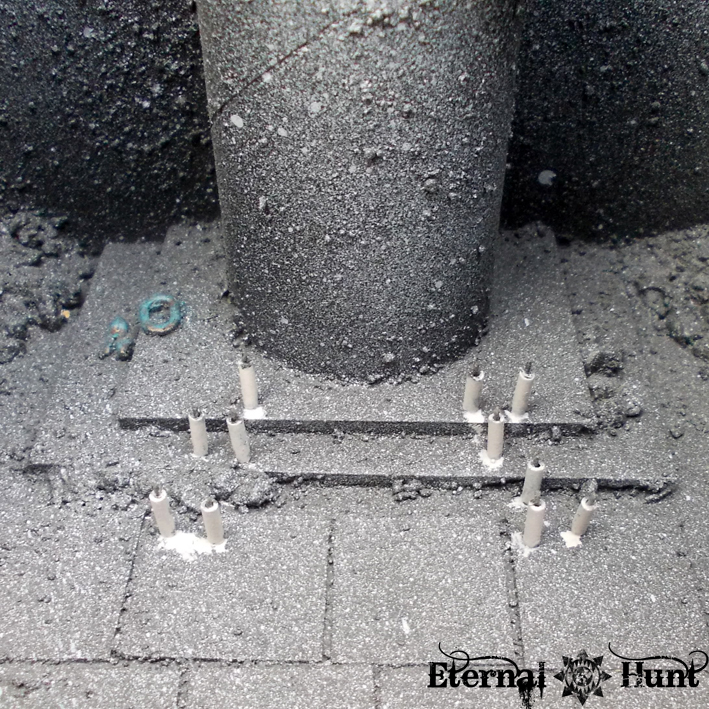 Leftover sprue can be used to add broken and bent support beams. And you can use small stones, cork and slate to add some rubble to the corners of the building. The thing to keep in mind when adding rubble is that the building should still be useful in games, so it can make sense to actually use less rubble than would be realistic (given the damage on the building) for the simple reason that you may still want to be able to place a squad of models inside. 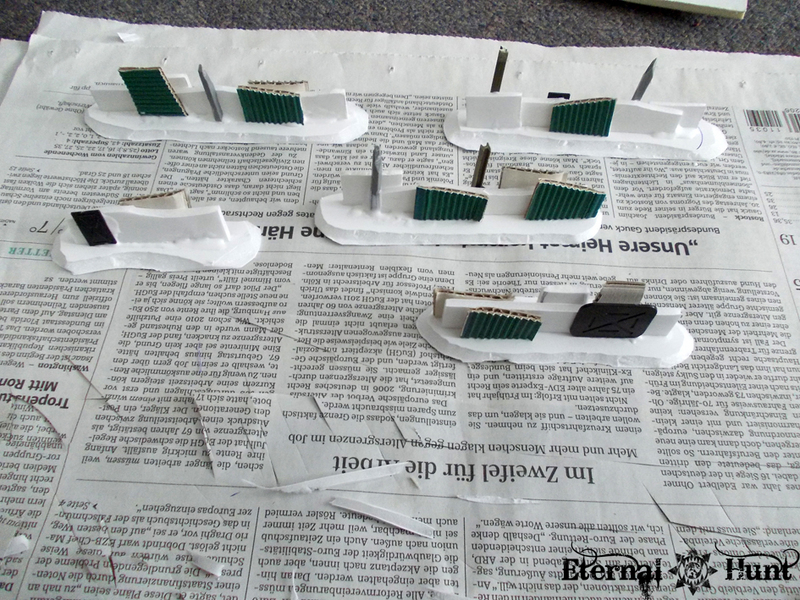 Oh, and one small thing: Definitely take the time to add some windowsills, cut from leftover foamcore! It doesn’t take long, but that small detail really goes a long way towards making your ruined buildings look more realistic! As you can see, I added a number of walkways as well as a central column. 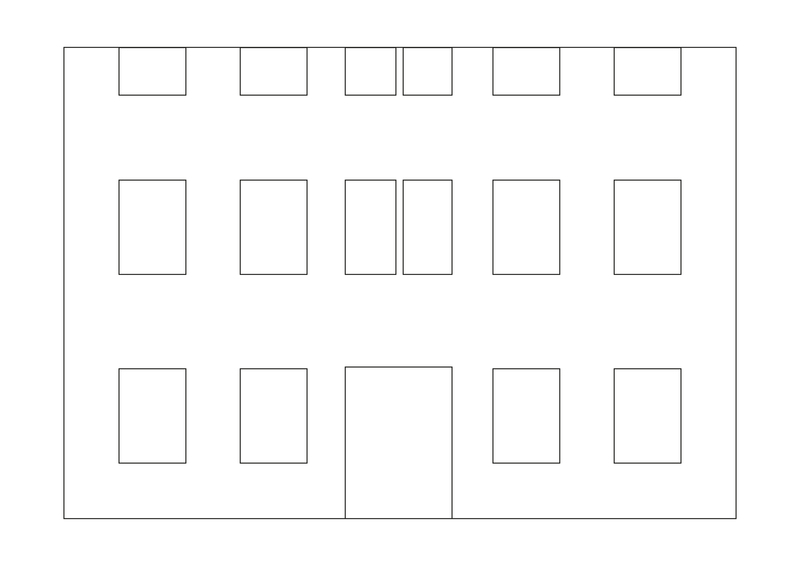 Still, the building was constructed using the exact same template as shown above. You can also really go to town on these buildings, adding all kinds of propaganda posters, additional bitz and what have you. 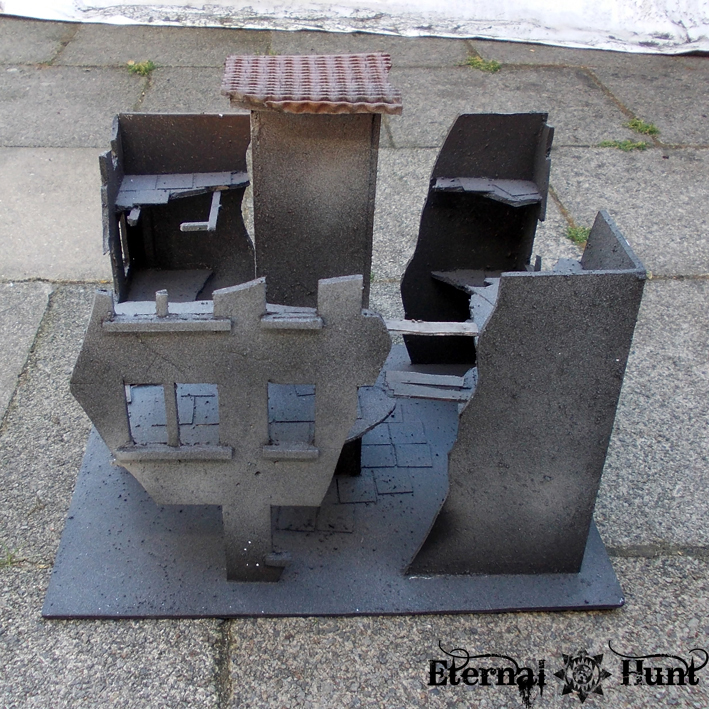 You could conceivably even combine your foamcore parts with parts of the GW cityfight buildings to spice things up a bit! 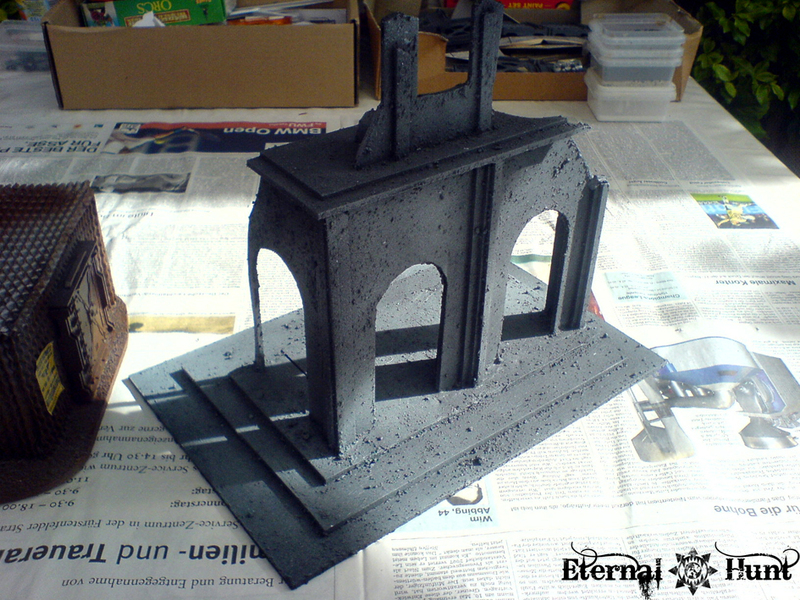 In my case, I wanted these buildings to be quickly usable, so I basically just undercoated them with texture paint, sprayed them with cheap grey paint from the DIY superstore and they were ready to go on the table. I already explained at some length that there are many great reasons for building your own terrain! And today’s post demonstrates that it’s really quite easy to do so. So get building! Any questions or remarks? 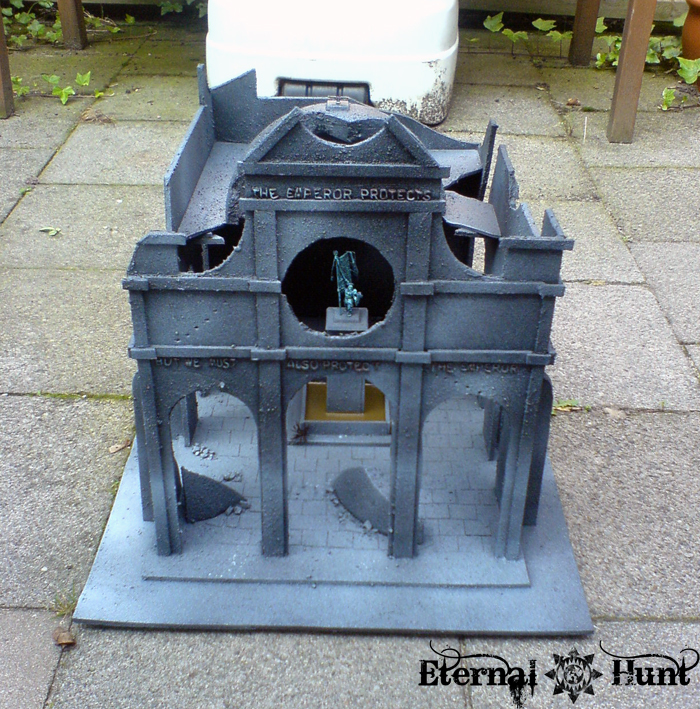 Or any buildings or terrain projects of your own that you would like to show off? I’d be glad to hear from you in the comments section! 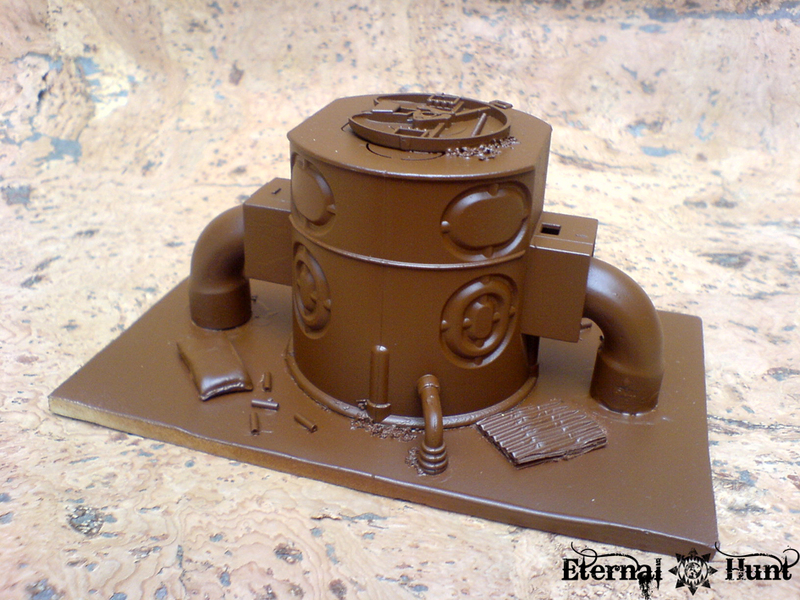 In between all the painting and kitbashing, let’s take time for a quick and easy recipe for building your own scatter terrain for games of 40k, Necromunda, Inquisitor 28 (or any other skirmisher, for that matter). 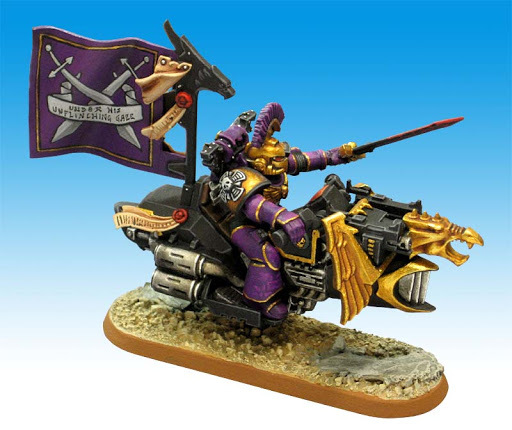 This is something for slow days, when you want to get something done on the hobby front, but don’t feel like breaking out all the colours and really going to town on a model. Let’s take a look at barricades. Some pieces of foamcore. For this you can basically use all the leftovers from other projects. 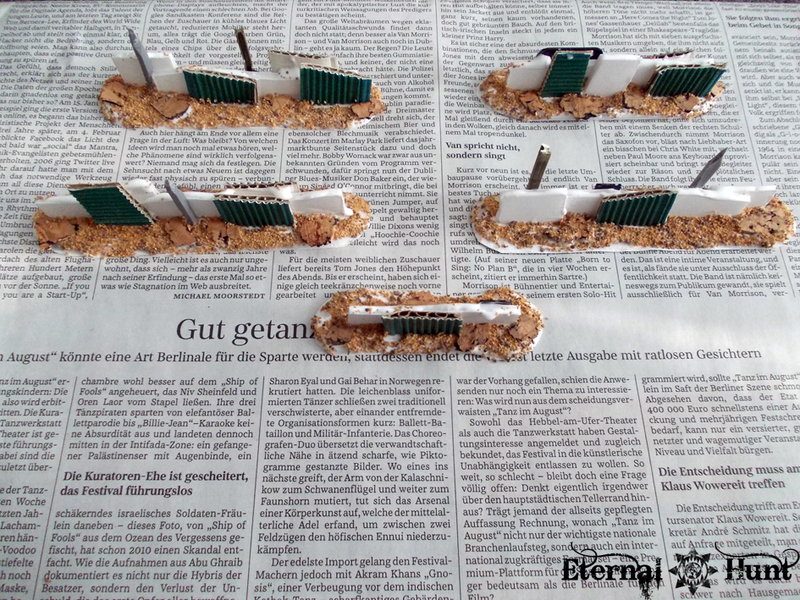 You’ll need a couple of longer cuts, though, to make the bases for the brarricades. Some corrugated cardboard. This comes in all shapes and measurements. Be sure to use cardboard that’s easy enough to cut. This will make for very convincing corrugated metal and help to break up all the otherwise smooth foamcore surfaces. A couple of bitz. Anything goes here. 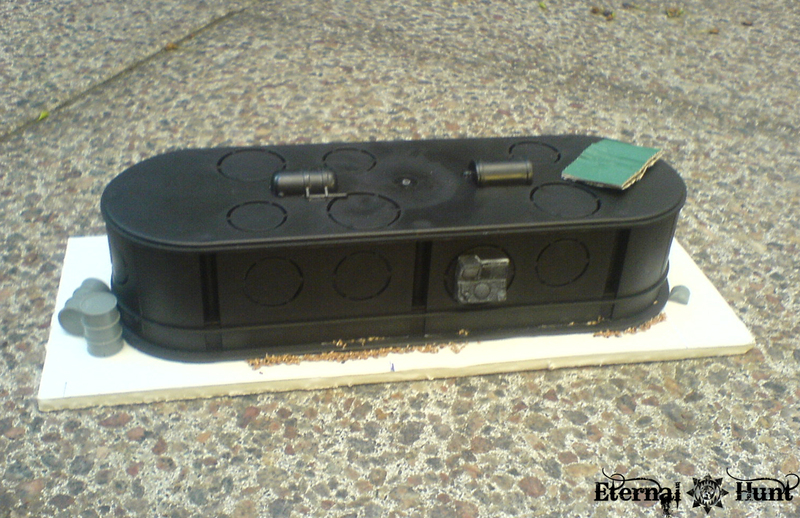 Choose whatever you find at the bottom of your bitz box. Vaguely technical looking parts are best. I used some parts from an old model truck and some stuff from an old military terrain kit. Oh, and pieces of leftover sprue make for great sharpened stakes! And we all have tons of that stuff lying around, don’t we? 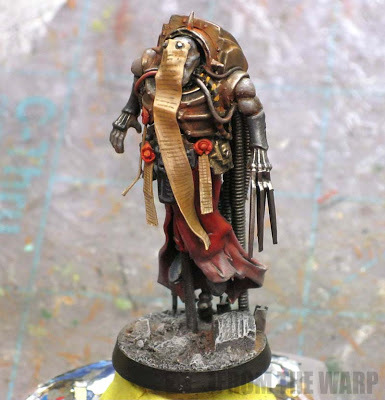 If you want to follow this recipe, you’ll also need some basing materials. Sand, cork, whatever you like. 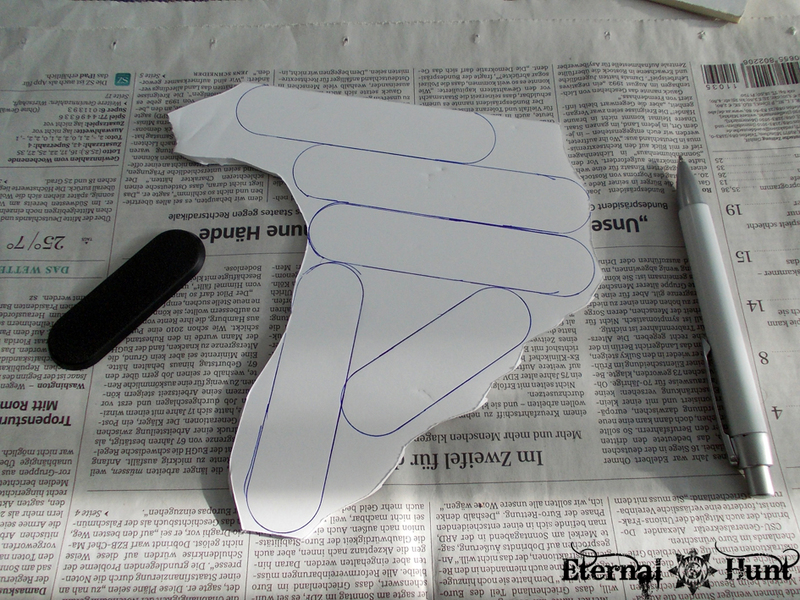 I started by drawing the outlines for the bases on some bigger pieces of foamcore, using a 40k bike base as a template. You can make all of the bases the same lenght, although it may be a good idea to make some longer and some shorter ones for added flexibility. I cut out the bases using a craft knife. 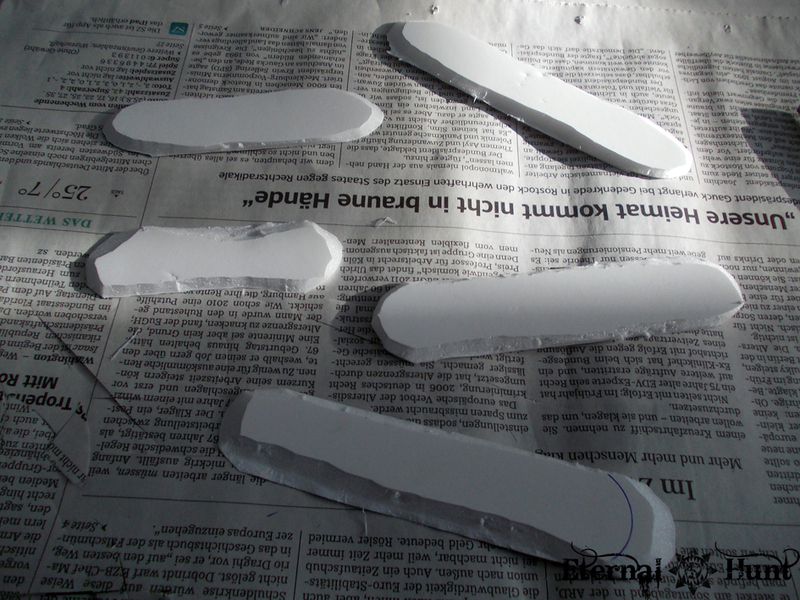 Then I beveled the edges of the bases with my knife. I did this so they would look more natural on the tabletop. 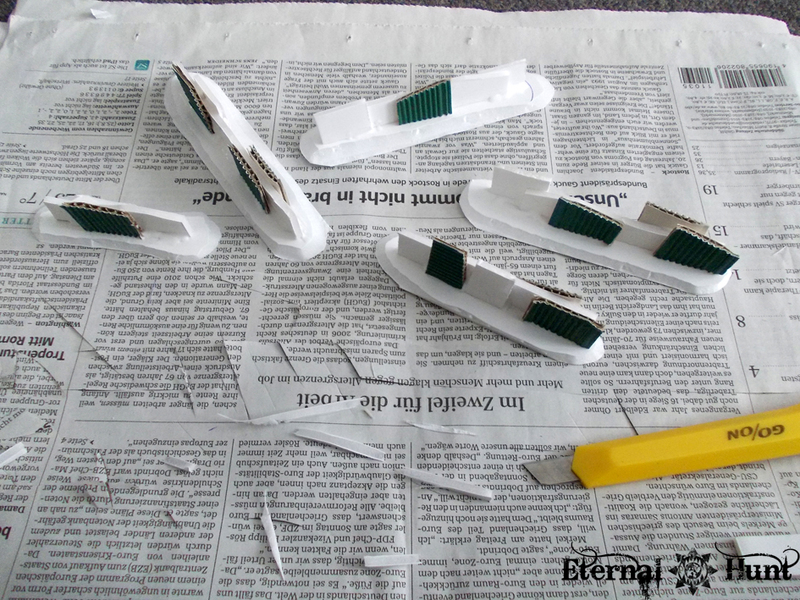 Don’t worry if your bases – like mine – do look rather messy at this point: We’ll be able to fix that shortly! I cut smaller pieces from the leftover foamcore and corrugated cardboard. 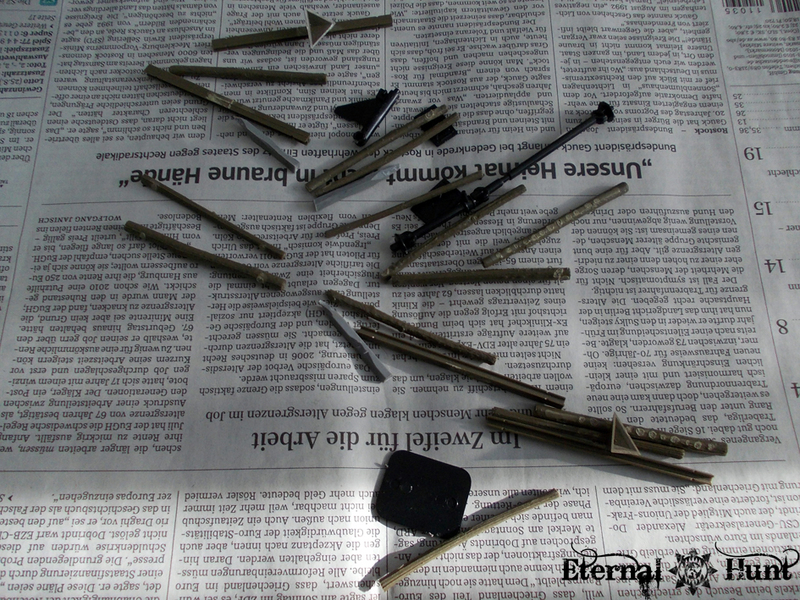 These pieces form the main body of the barricade, so make sure to have a nice selection of different lenghts. The less rectangular the shape, the better. 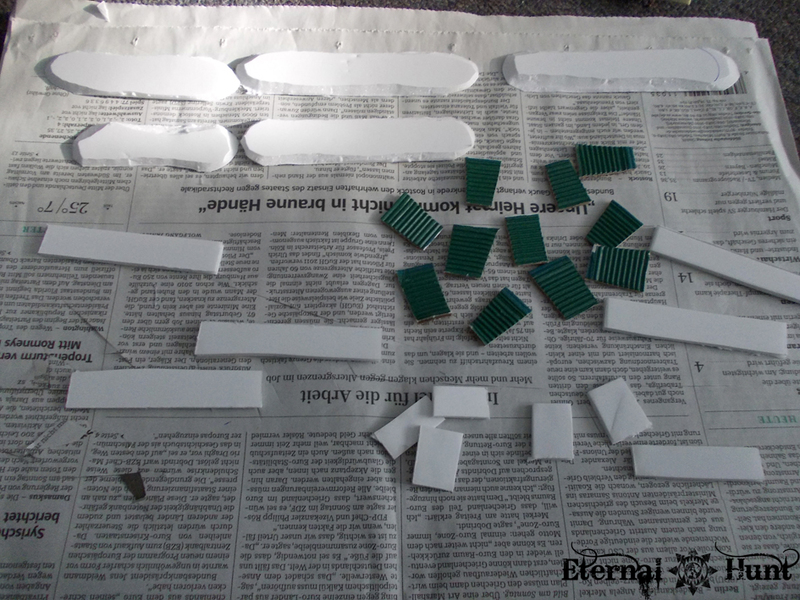 I then glued the smaller pieces onto the bases using wood glue. I tried to make this basic construction look pretty haphazard, like random pieces had been collected and thrown together. 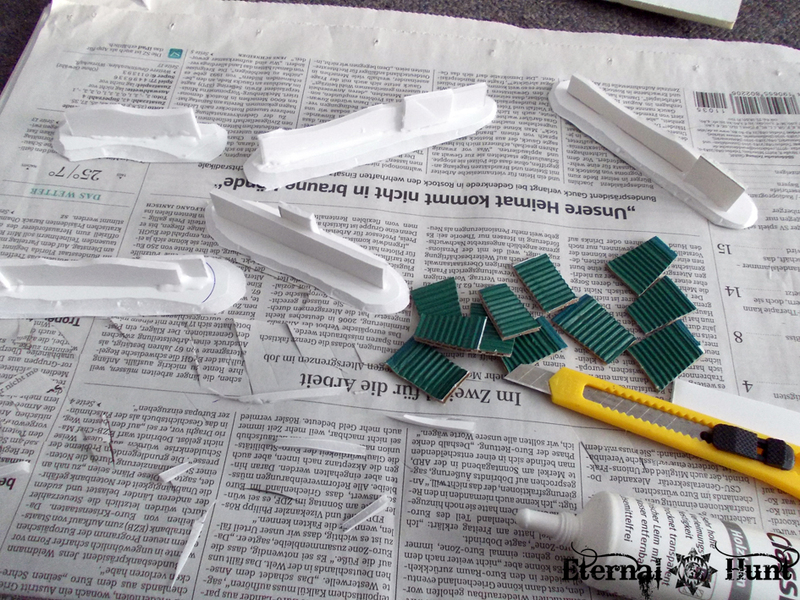 ..and repeated the same step with the leftover bitz, sharpened pieces of sprue etc. At this point, the basic construction was finished. Then I added my basing materials to the bases, using wood glue to glue them down. 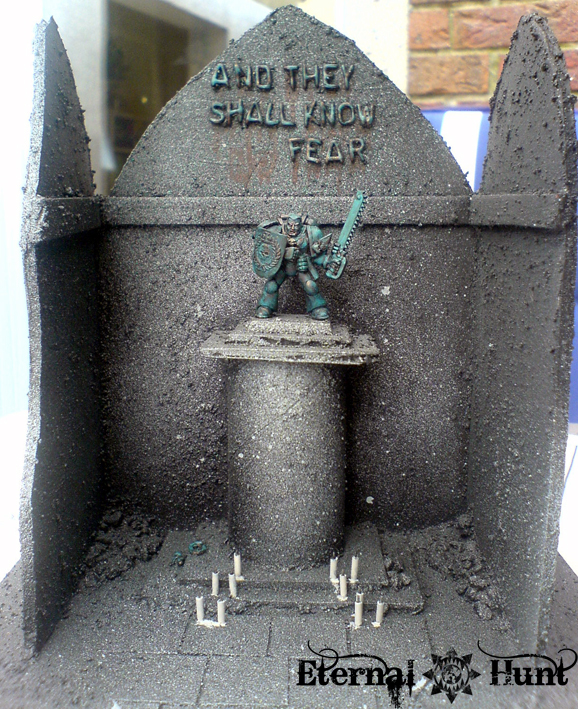 In this particular case, I used a mix of GW modelling sand and small pieces of cork. 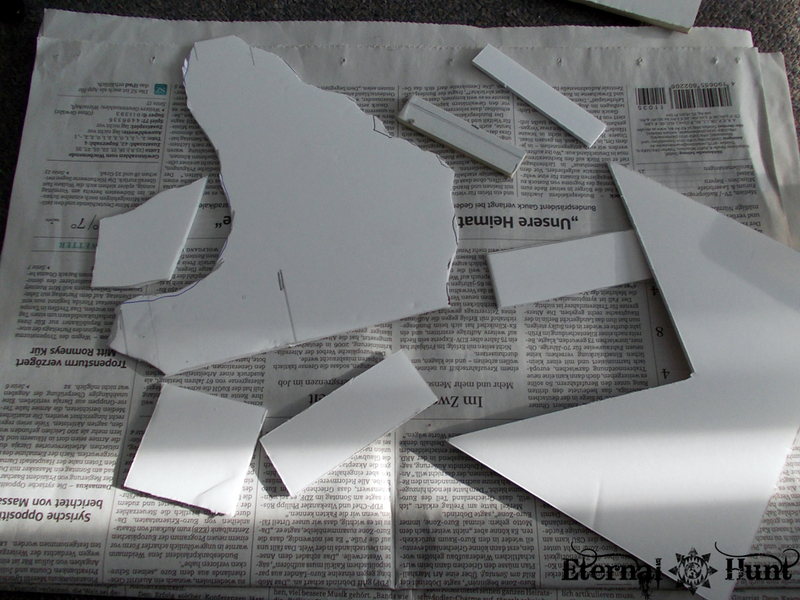 I also used the glue to seal all open areas of foam, so the foam wouldn’t disintegrate during the next step. Then everything was painted using cheap spray paint from the craft store. 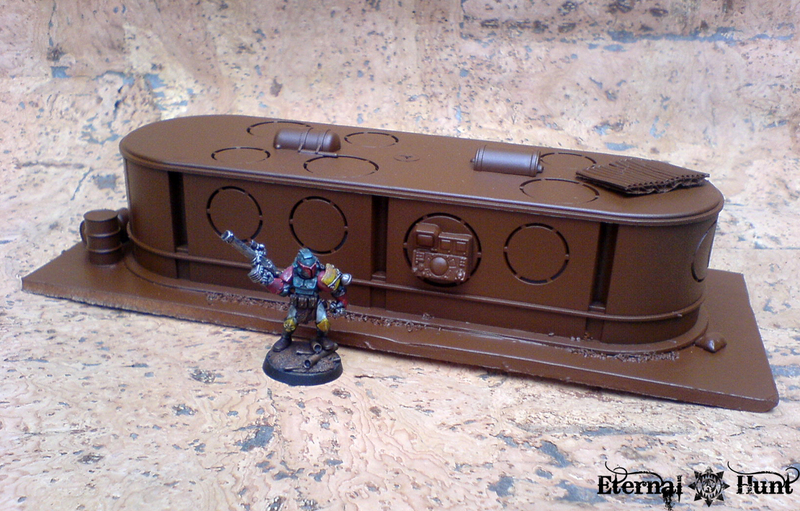 I chose brown as a basecoat because I wanted the barricades to have a rusty, dilapidated look. As you can see, the unified paint did a great job of tying together all the disparate parts. 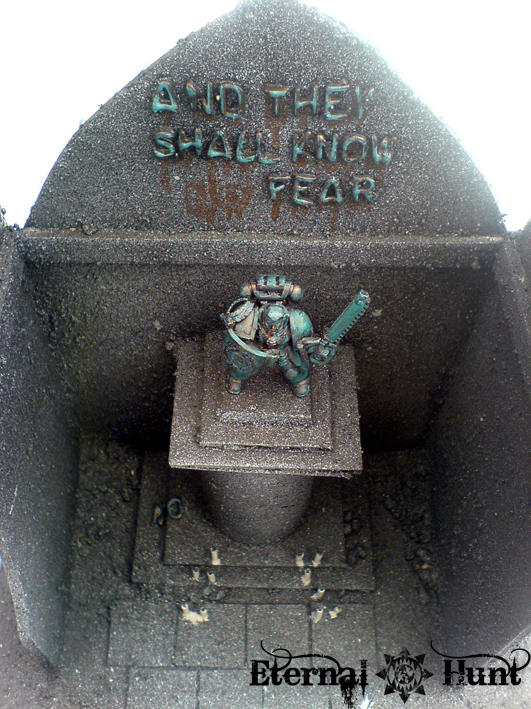 I then stippled GW Vermin Brown onto the barricades, creating patches of rust. 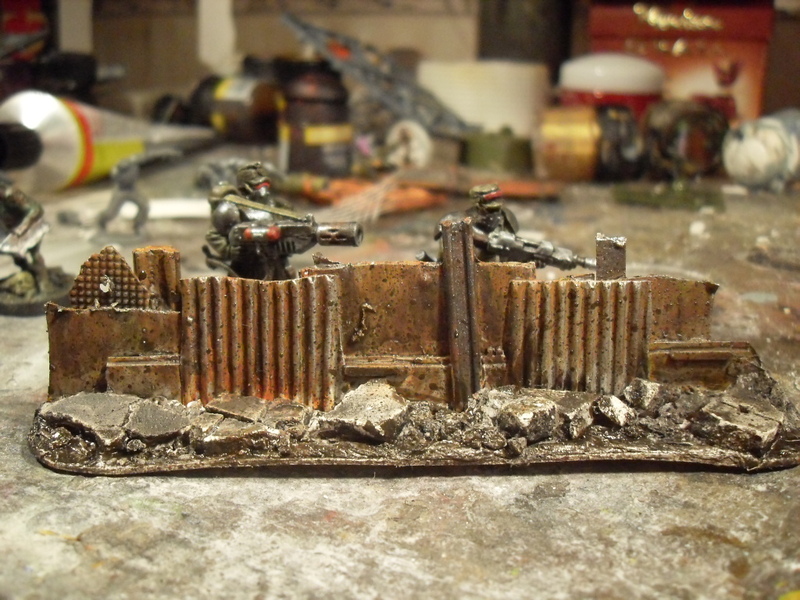 Then I drybrushed the edges of the barricades with GW Boltgun (also stippling on some more Boltgun Metal). Then I painted thinned down Vermin Brown into the recesses — especially on the corrugated cardboard! 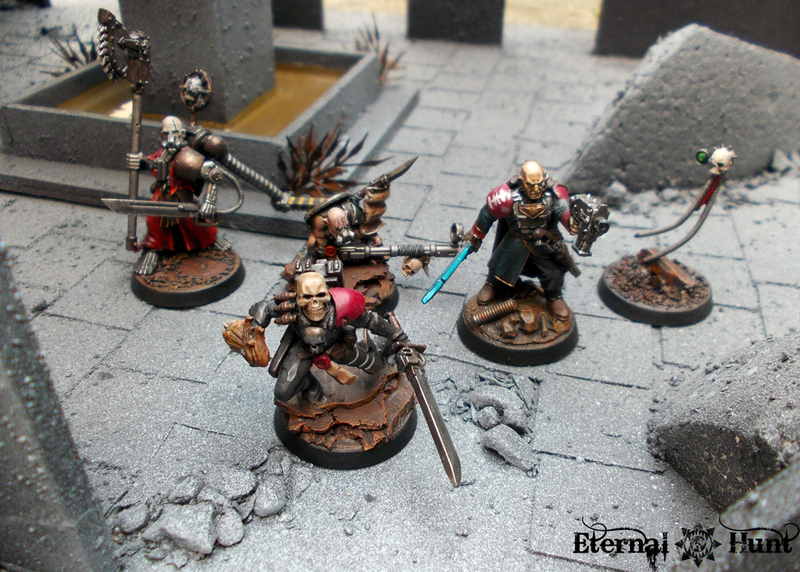 The sand and cork on the bases were drybrushed with GW Bleached Bone. 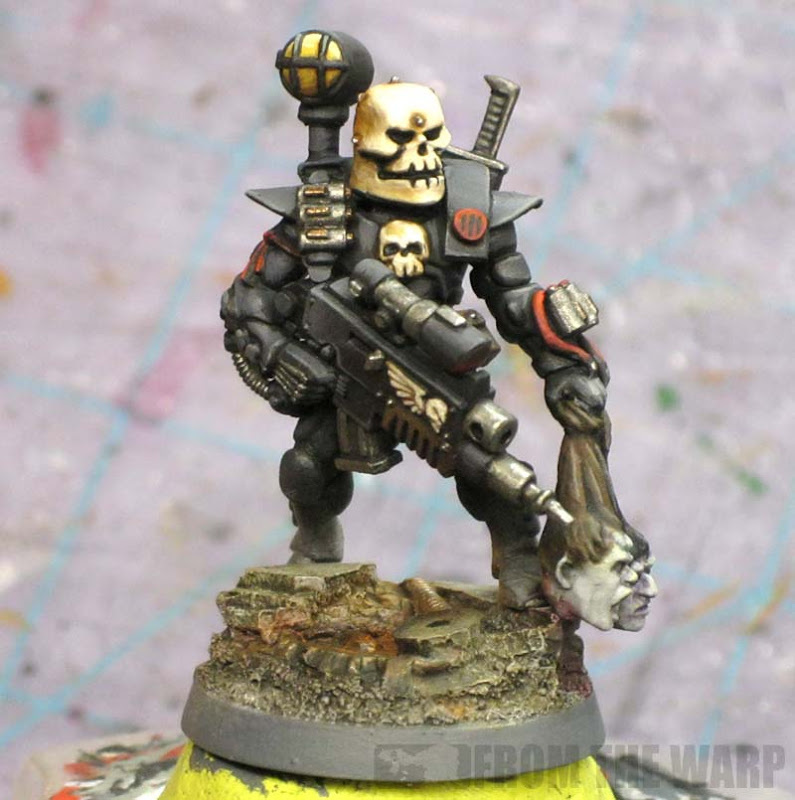 And lastly, I used GW Nuln Oil to paint on patches of oil, grime etc. This was the easiest recipe I could think of. 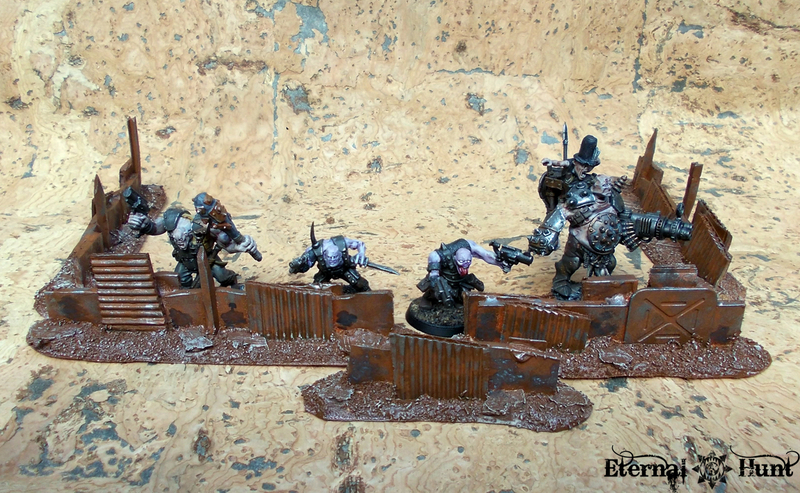 These barricades come at basically no cost, and you’ll be able to churn out a ton of them in no time at all! 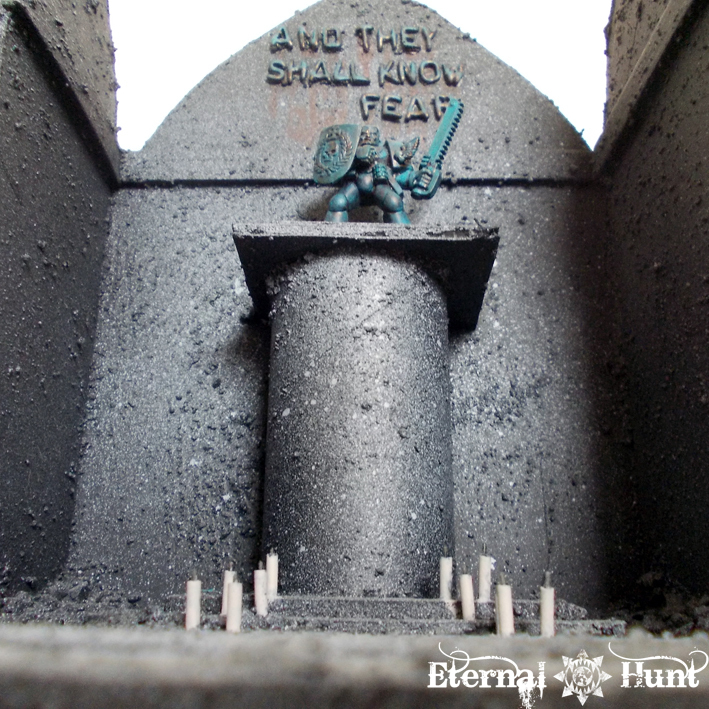 Of course you can add some more variety by adding different colours, propaganda posters and all kinds of bitz. Ultimately, this may be the easiest terrain project I have ever done (and probably the one with the most bang for the – nonexistent – buck!). 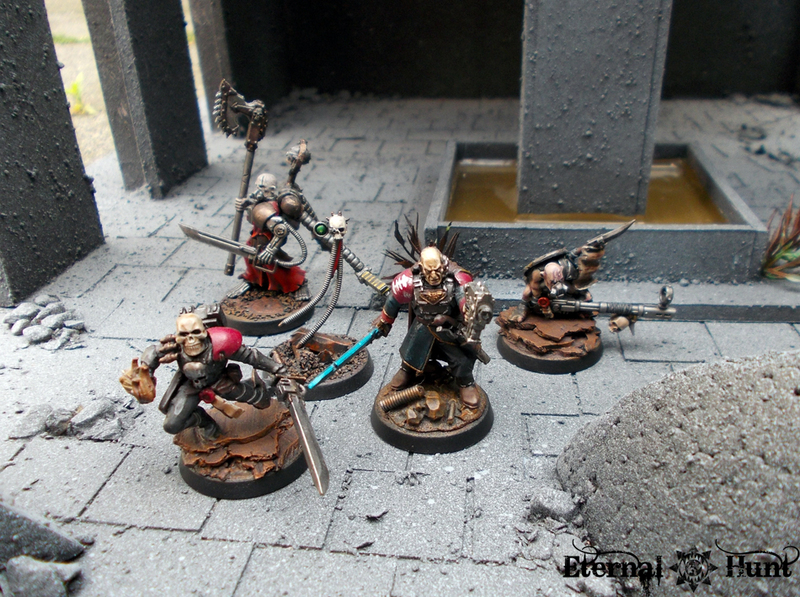 Scatter terrain like this will come in handy during games of Inquisitor or Necromunda. And, as I have tried to show you in this post, it’s ridiculously easy to built, at basically no extra cost! Thanks to DRommel for the inspiration, and as always, thanks to you for looking! Stay tuned for more! Now I couldn’t even tell you what these things are normally used for – especially not in English. They are used by electricians when working on electrical outlets or something — pardon my spotty knowledge when it comes to electrical installations. 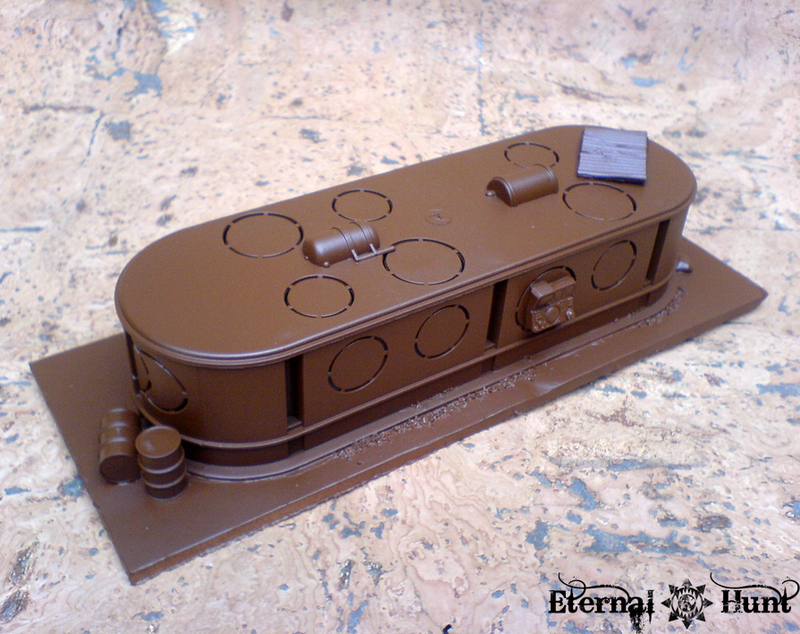 But I instantly realised that these could be really useful for a terrain project: The smaller part seems immediately useful, and you may call me crazy, but the longer piece gave me an almost art deco vibe. Does that make sense? To the small piece, I added a couple of small brass tubes I had lying around as well as some corrugated cardboard, cork chaff and one or two pieces from an old model truck. 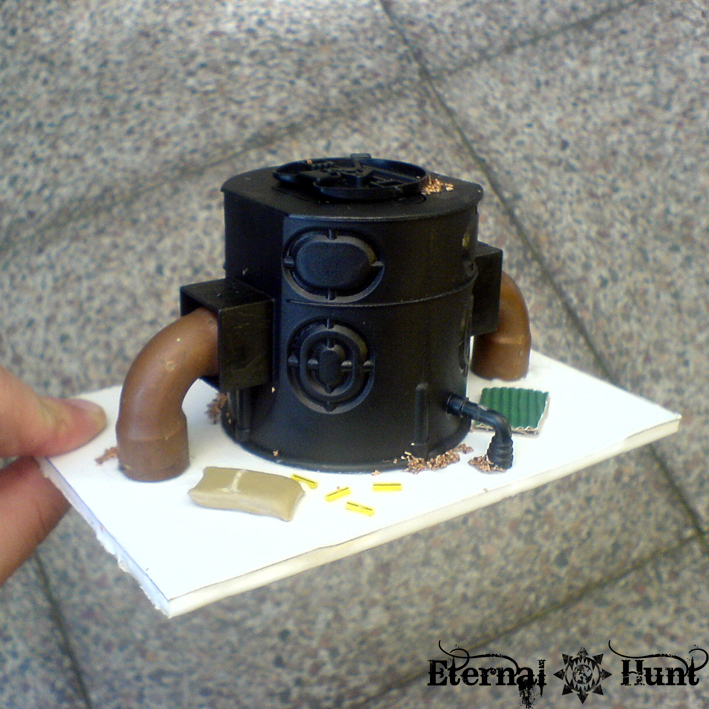 And behold, the thing was instantly transformed into something looking very …industrial. All of this was really quick and easy work, and I only needed some leftover materials and a couple of bits. 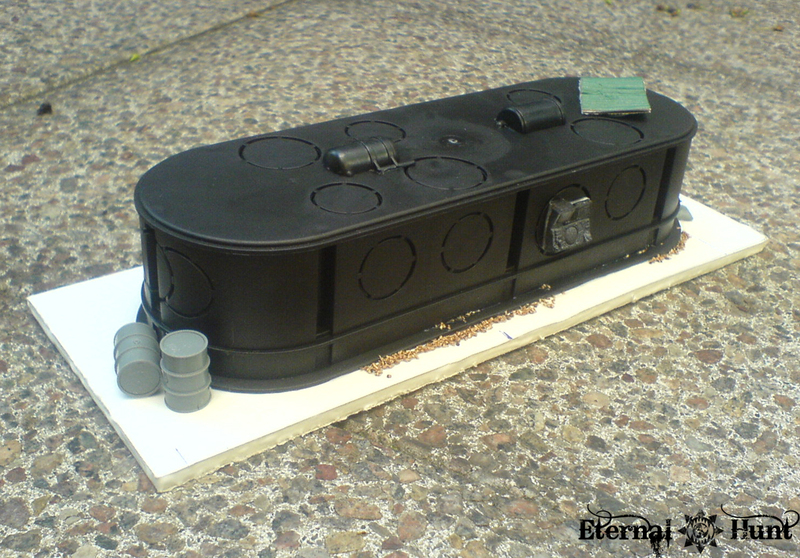 I then spraypainted both pieces with brown paint, since I would probably end up going for a rather dusty and dilapidated look amyway. Granted, one of these alone is fairly unimpressive. But imagine several of those pieces that can be freely rearranged to create all kinds of different setups: You could simulate corridors or a kind of labyrinth. And the fun doesn’t end there: Just build a number of modular walkways to connect the different pieces and add some verticality. Or add some taller buildings for even more variety. 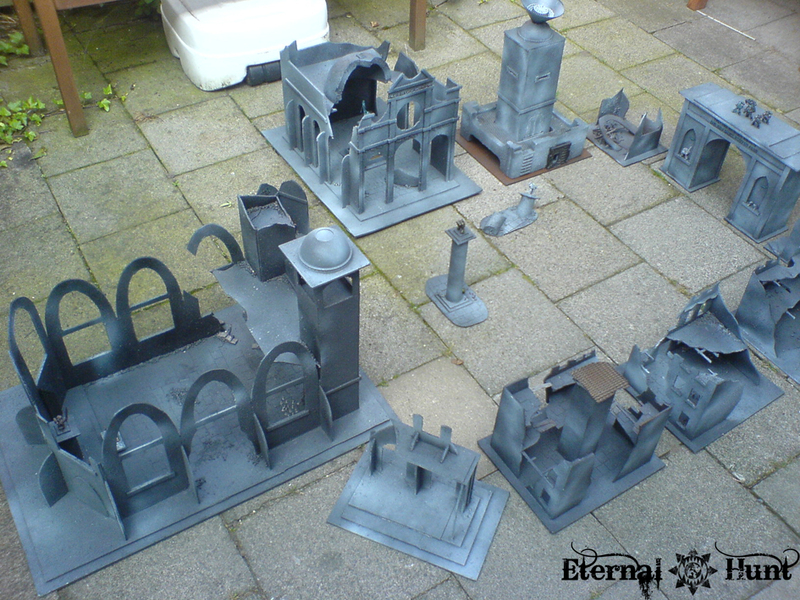 These pieces could even be combined with my regular cityfight terrain! And the fact that they are fairly small and robust also makes them rather easy to store — what a relief! 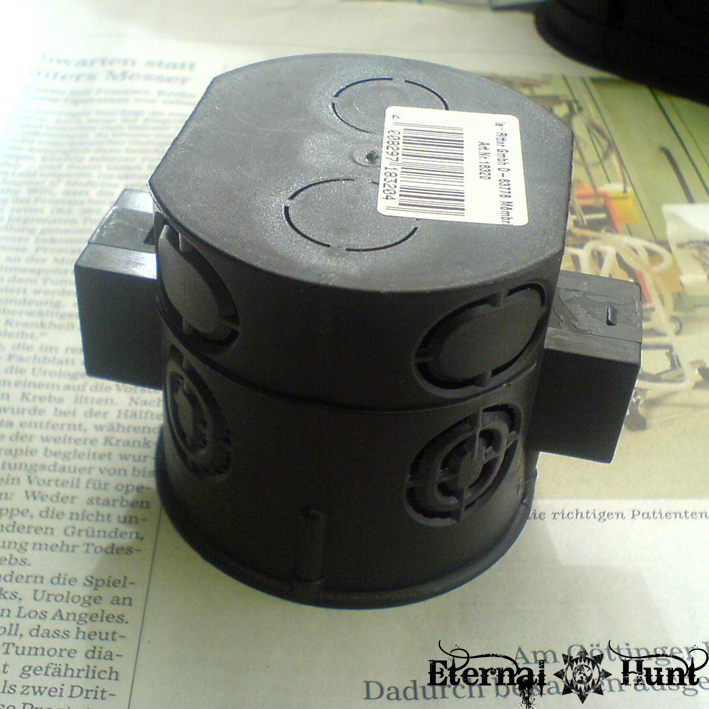 Of course, these pieces will yet have to be properly painted, probably with huge amounts of weathering and rust. 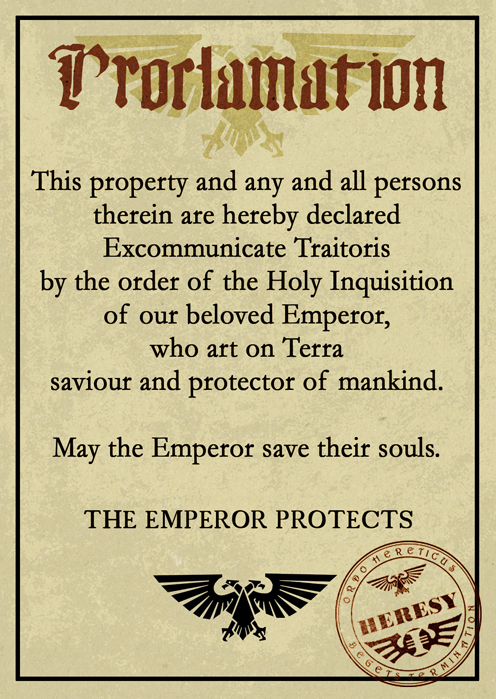 I could also add all kinds of security warnings and/or propaganda posters for more authenticity and that particular underhive look. It probaly won’t surprise you when I tell you that I went back to the store the next day and got a whole bag of those pieces. About 8 Euros gave me enough stuff to fill up quite a lot of space on a normally sized Necromunda/INQ28 table. I’ll keep you updated on the progress! 5.) Building terrain is a great outlet for creativity! I realised a long time ago that creativity and its expression are really crucial to me as a person. 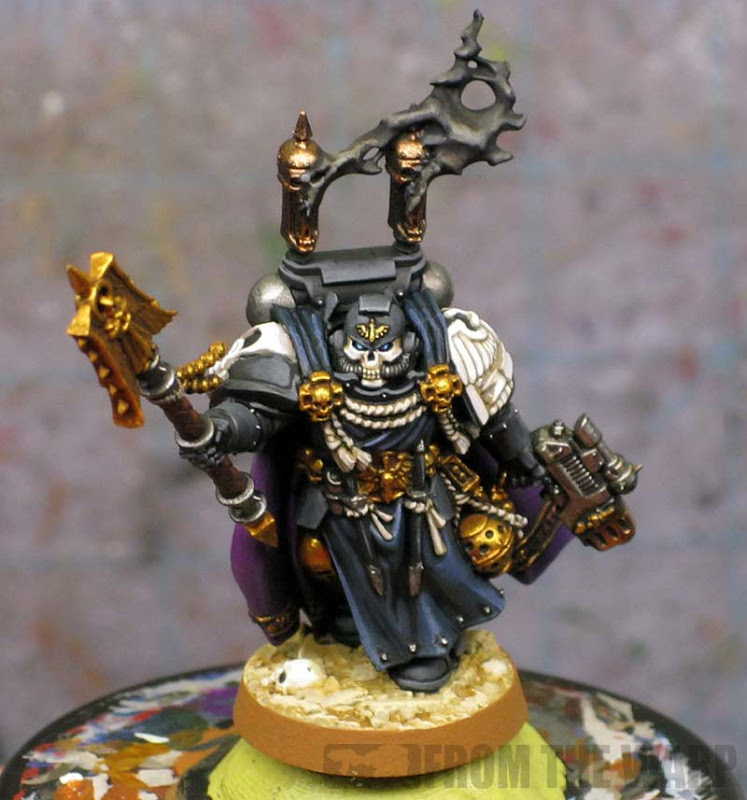 Towards thit end, most of the things I do in the tabletop hobby really follow the goal of doing something creative, whether it’s converting models, inventing background stories for them or building suitable pieces of terrain. And it’s true that building terrain lends itself very well to expressing creativity, simply because there are very few boundaries. 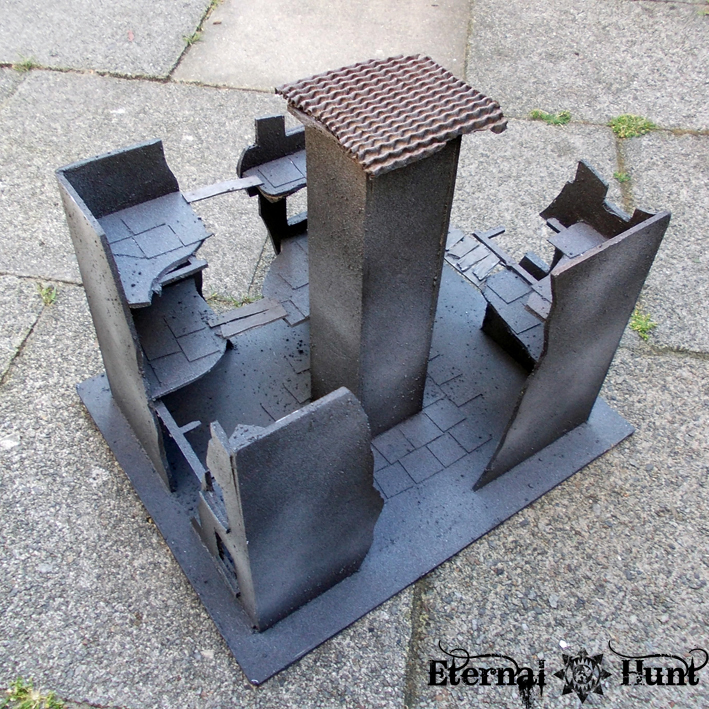 I have tried to show you that even your most basic household materials can be used to build your own wargaming terrain, so your own imagination is really the limit here. It’s all about coming up with an idea and seeing it through to its conclusion. If that sounds a little too sketchy for you, I have an example of course. And a couple of pretty pictures to go with it. I wanted this to be usable as a piece of terrain in its own right, but it was also a way to try implementing all of the different elements I outlined above. 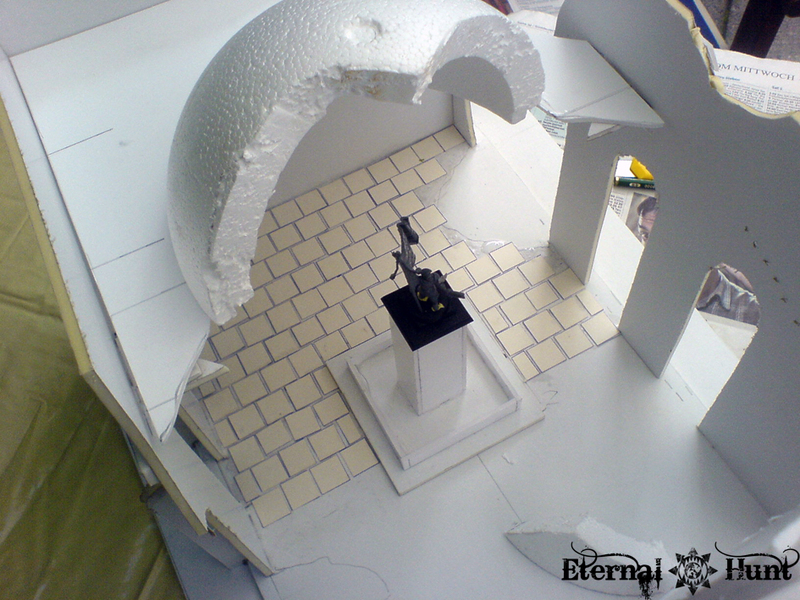 Once again, the main construction was done with foamcore and a leftover cardboard roll. 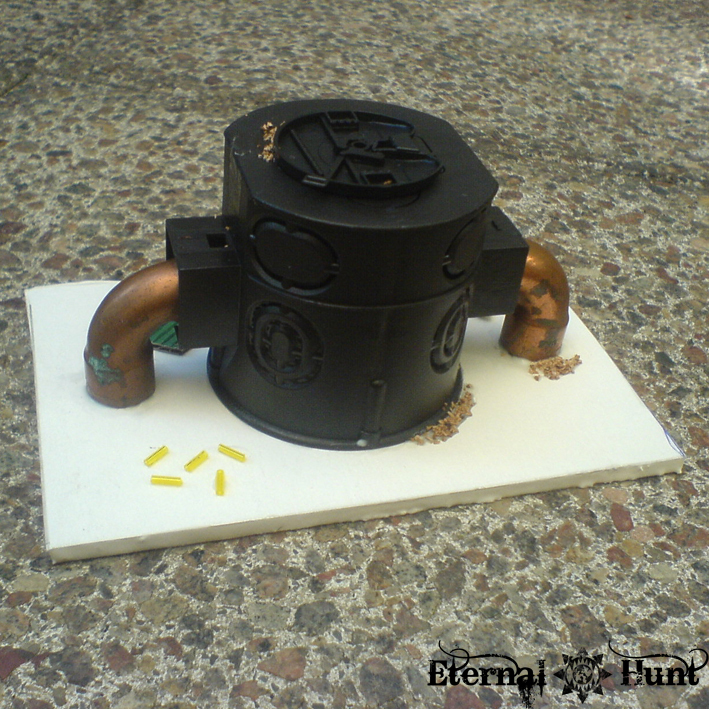 The statue of a nameless Space Marine hero formed the center of the piece. 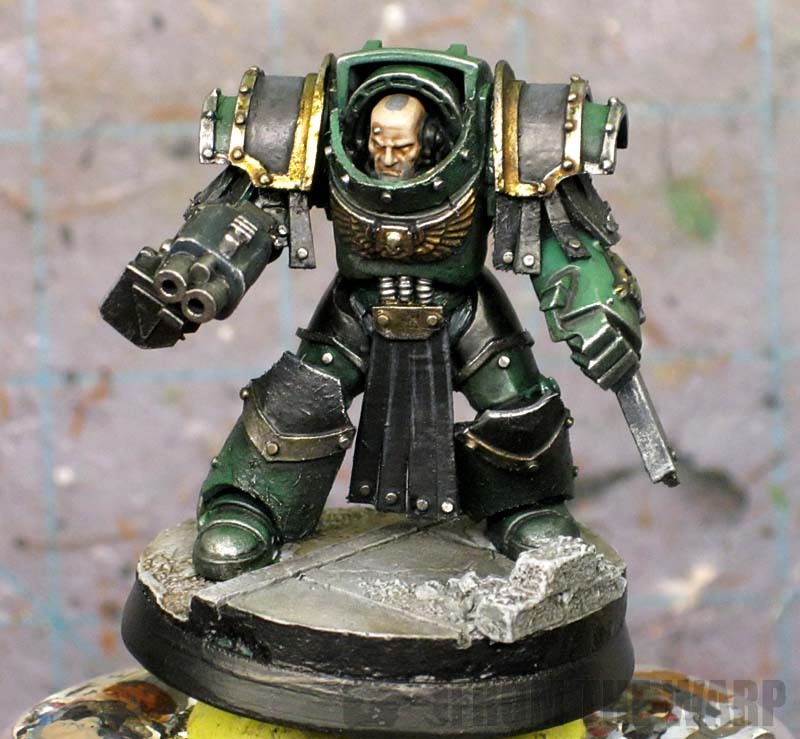 I used an old 2nd edition Sergeant and added a few bits to make the model look more impressive. 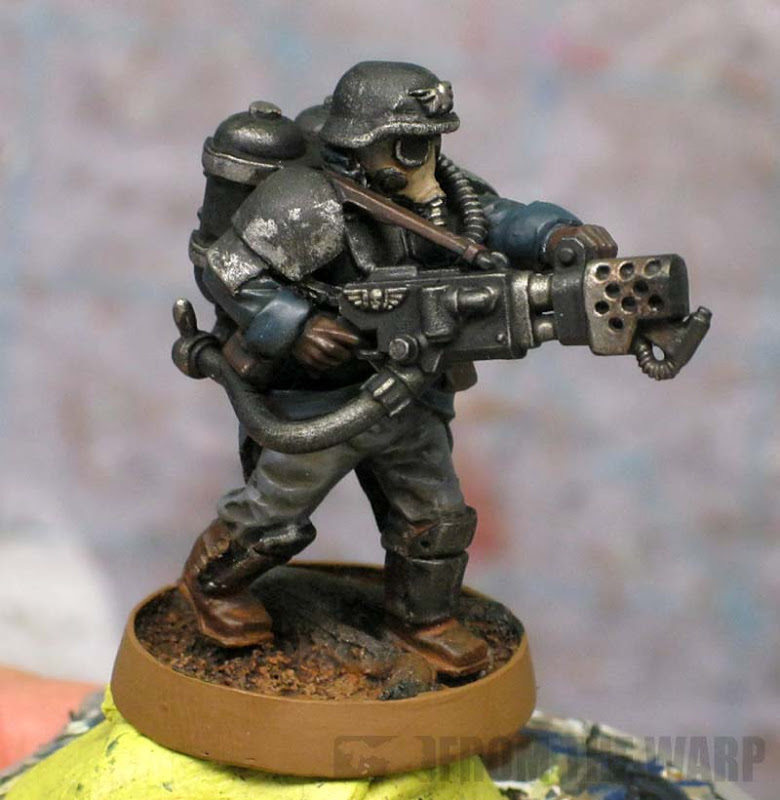 Then I experimented with a couple of paints until I found a nice way of representing patina: The model was basecoated with GW Tin Bitz (or Vallejo Tinny Tinn) and then lightly drybrushed with a lighter Bronze Tone. 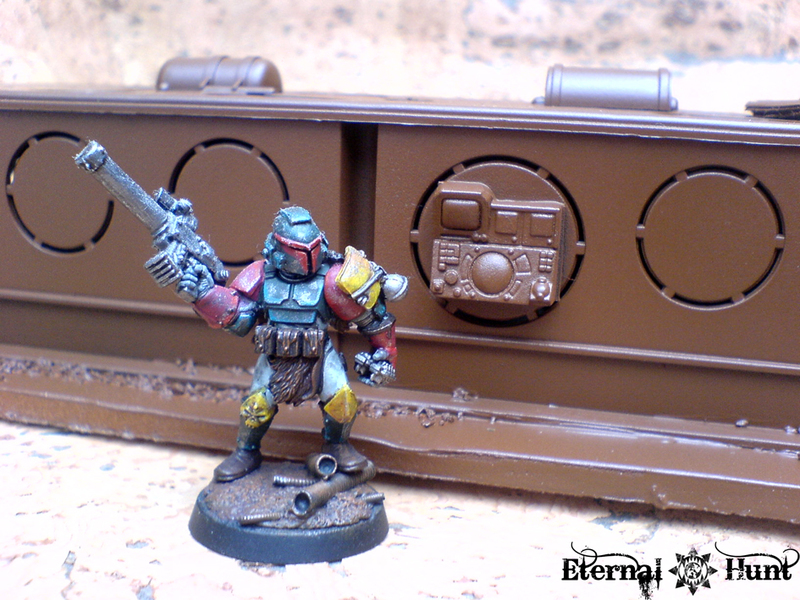 Afterwards, a mix of Vallejo Halcon Turquoise (or GW Hawk Turquoise) and Skull White was liberally dabbed onto the model. Then I tried to do my own inscriptions, using alphabet noodles as a cheap and readily available resource (an idea I took from Oldschool’s very nice German terrain blog). I added some splashes of colour to represent the candles slowly melting. Again, this was very easy (if somewhat fiddly) to do and yet made for a pretty convincing result. 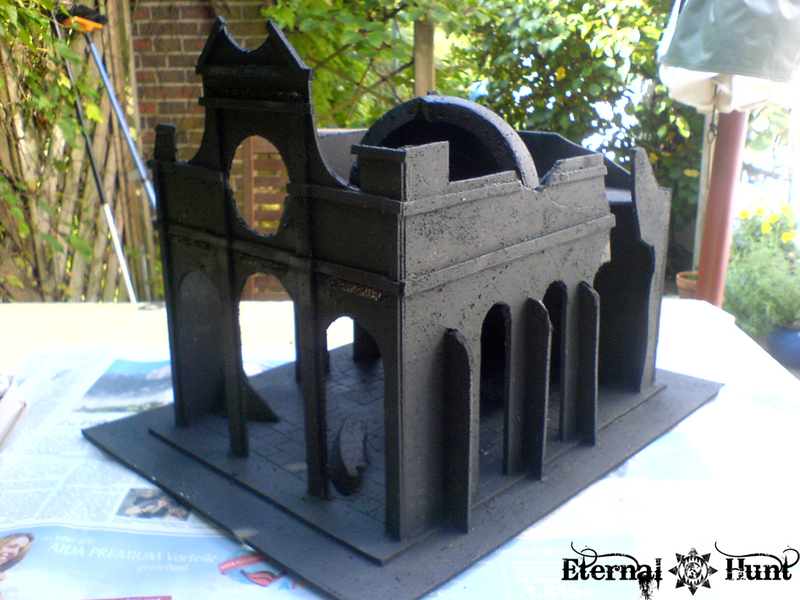 Building this concept piece really helped me to nail a look for my bigger buildings (like the cathedral). I learned a lot of useful techniques, even beyond the things I had wanted to try. 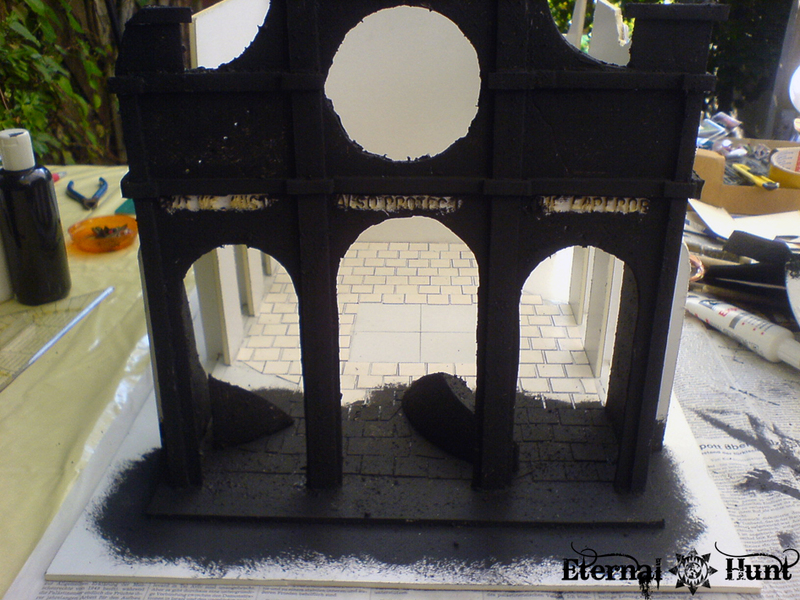 For example, I used cardboard from a cereal package to make the flagstones – a recipe I have since used on many pieces of terrain. But that was not really the most important thing. The most important thing was to see this whole project as an outlet for creativity: Thinking of things I wanted to do and then coming up with a cheap and easy way of doing them. 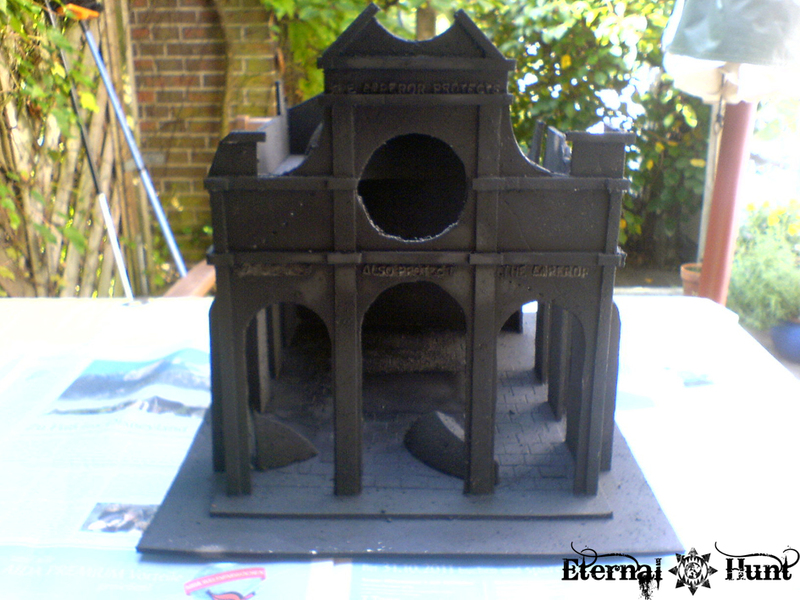 And thinking up little elements that would help make my terrain more believable. It’s true, building twenty identical ruins isn’t a great outlet for creativity — although it’s sometimes just the thing you have to do to get the necessary amount of terrain together. But you can still be creative: Think of a little something that will make each of those ruins stand out. Then think of how to make it work. Then you will truly have made something! Of course this also goes for assembling terrain kits you buy. You could assemble them to look just like they do on the package. Or you could go the extra mile and use your creativity! 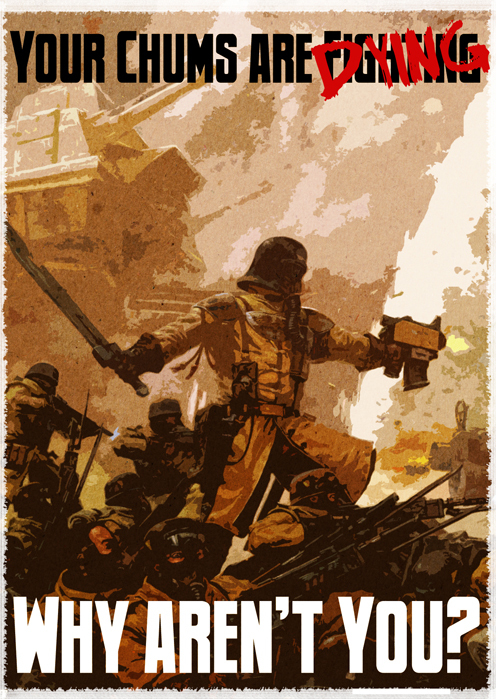 This one is based on an old propaganda poster from World War I. I kept the slogan and just added it on top of a picture of the Steel Legion in mid-fight. I used some Photoshop filters to make the image look more stylised and desaturated. 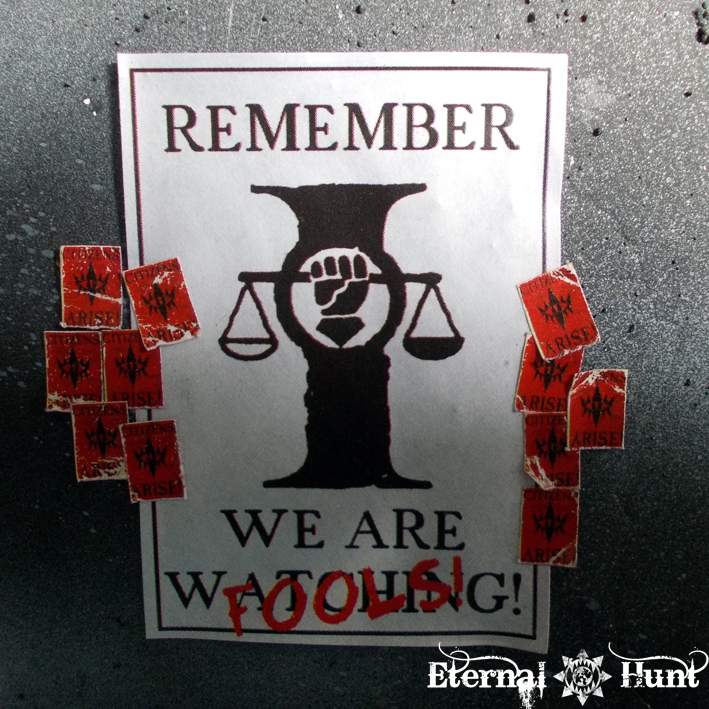 There’s also some graffitti, probably added by cultists in order to deface this symbol of the Imperium. 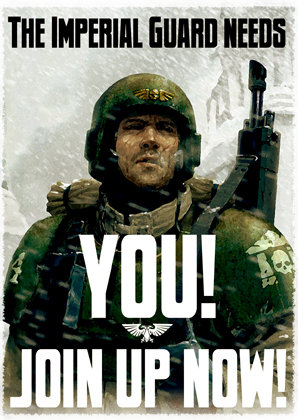 And while we are on the subject of the Imperial Guard: Your terrain just won’t be the same without a generous helping of recruitment posters. Ahh, a true classic, this one. 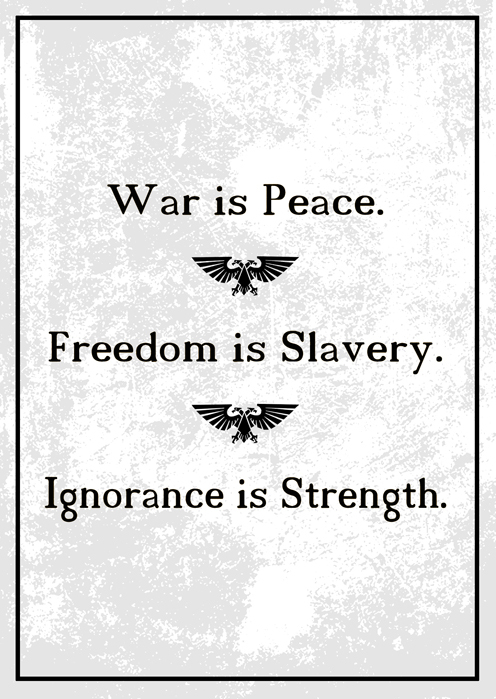 Oceanian propaganda appearing courtesy of Mr. George Orwell, ladies and gentlemen. Posters like these are easily designed using Photoshop, Gimp or similar software. 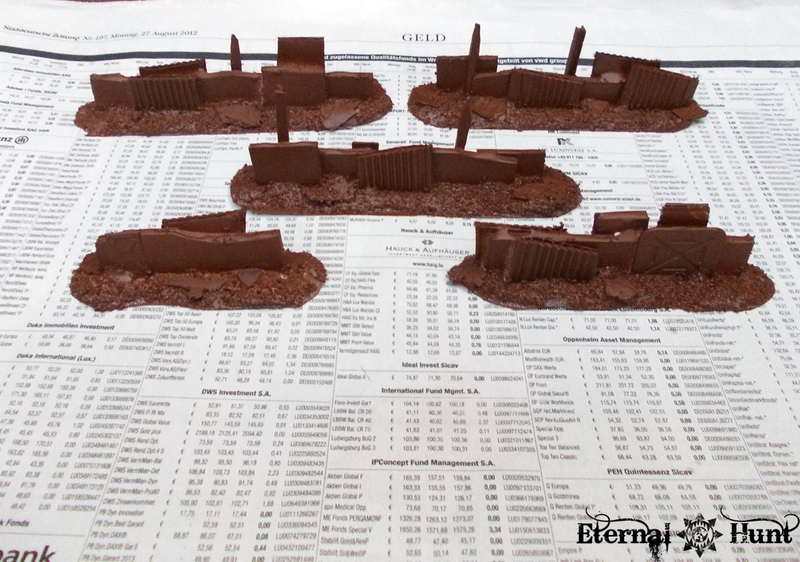 Then you can print them out at different sizes and use them on your terrain for some extra oomph. 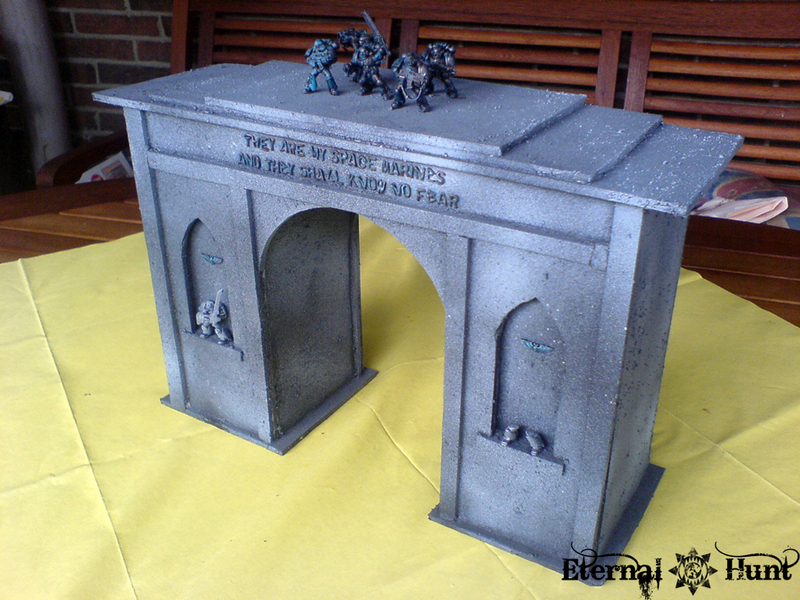 You can even use this to add some narrative touches, to tie your terrain into an ongoing campaign or your existing 40k force! 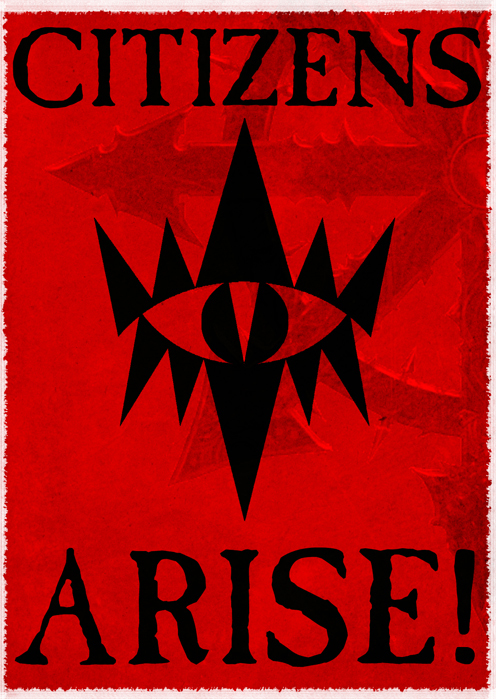 It’s using the symbol of the Word Bearers’ Piercing Gaze Chapter (my Word Bearers force then. 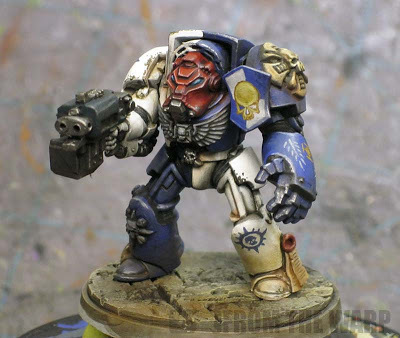 Alas, I have since turned my attention to the World Eaters, as you all know…). 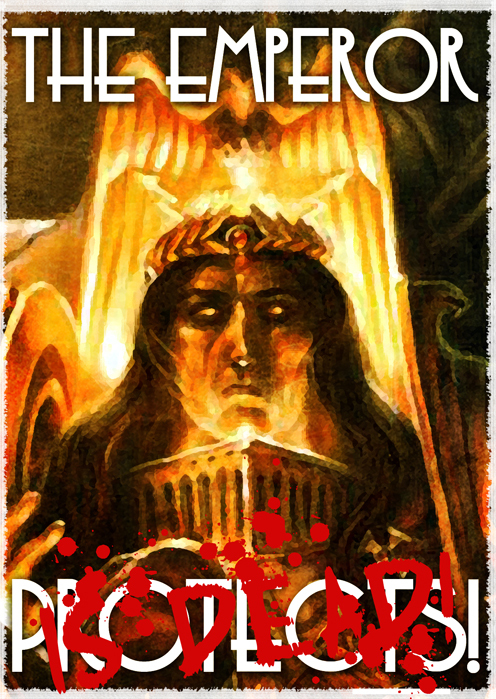 The idea was that the Word Bearers had managed to infiltrate a world and begun to announce the planet’s salvation (i.e. their arrival). It’s little things like these that will not only help in making your terrain better, but will also be a tremendous outlet for your creativity! Just get going, you can start small! And it won’t be long before you’re doing stuff you didn’t even realise you were capable of! 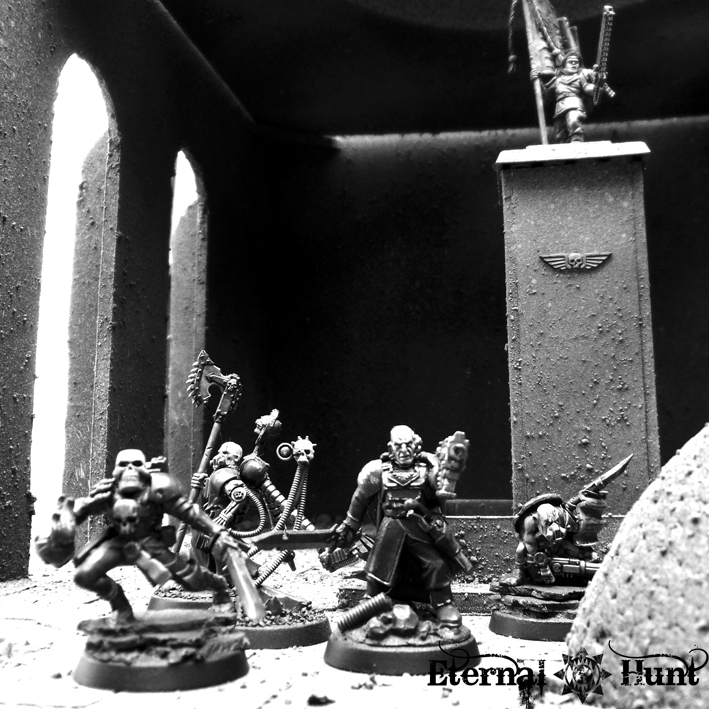 And while my own mediocre attempts may not be enough to convince you, let me just relay you to a true master of the craft: Just take a look at thenickeninja’s blog to see how using propaganda posters adds just the last bit of plausibility to your pieces (and how random pieces of junk can end up as truly spectacular wargaming terrain). 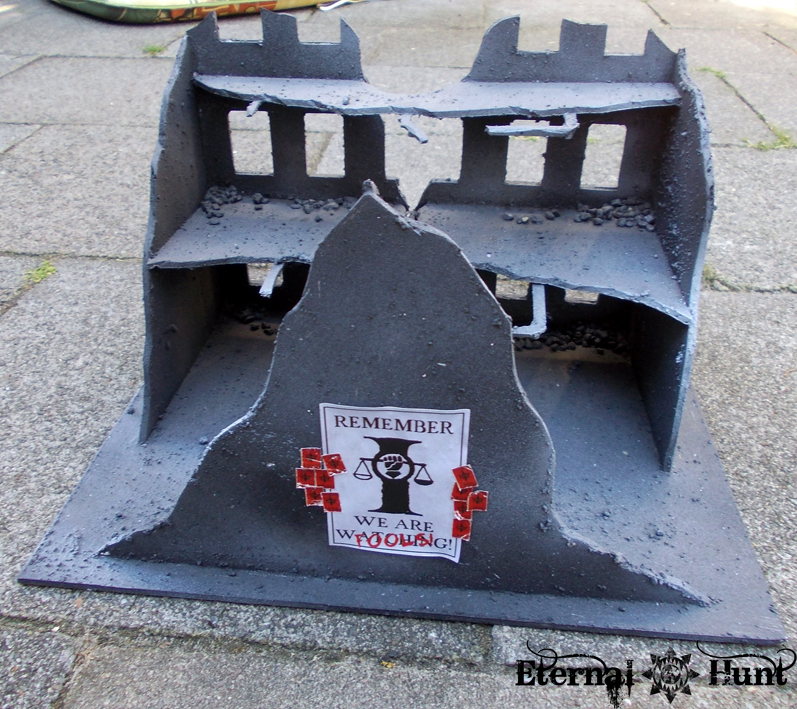 And with that, my small treatise on the joys of building your own wargaming terrain is at an end. I hope that I managed to point out the merits of this increasingly lost art to you. 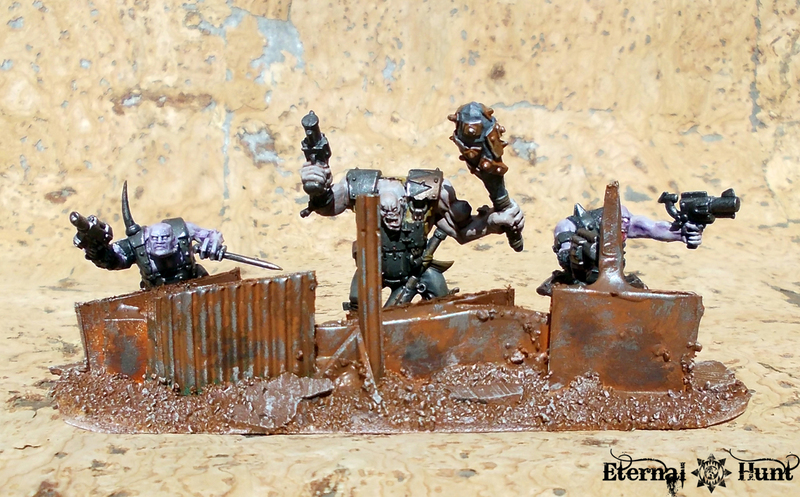 Of course I’ll be posting more of my own terrain projects on this blog over time. And without a doubt, most of them won’t look nearly as spectacular as the stuff published in WD. But I can assure you that all of my stuff will have been fun to build, cheap, a nice change of pace and a great outlet for creativity. And all of it will be my own (except for the original GW artwork of course, I still don’t own any of that stuff 😉 ). 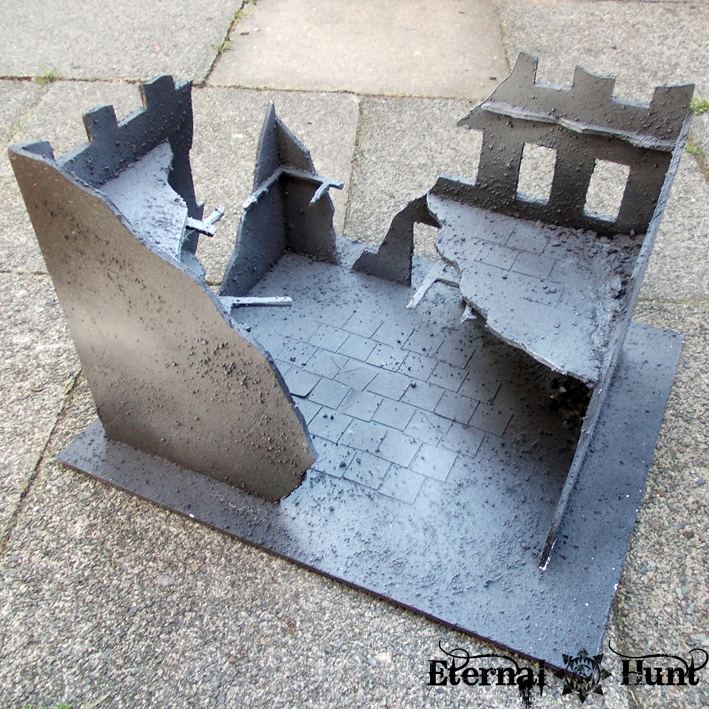 If you want to share your own experiences with building terrain, drop me a comment! And, as always, thanks for looking and stay tuned for more!